Work in progress Everything is in place for the most part, just need to go through and clean some stuff. Any suggestions or corrections are welcomed. 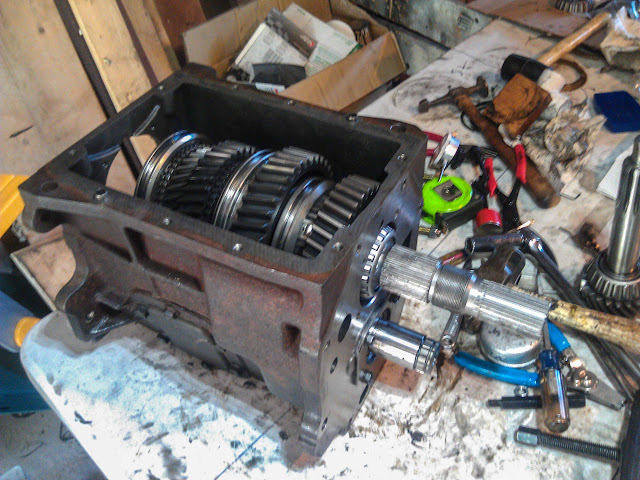 Here's a step by step rebuild of an NV4500 with pictures of every single step. 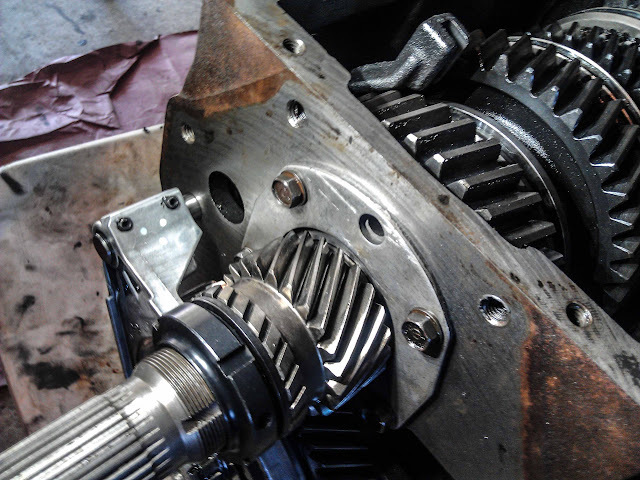 This will help if you're thinking of rebuilding the NV4500, upgrading to a larger input shaft, or trying to trouble shoot a problem like fifth gear. 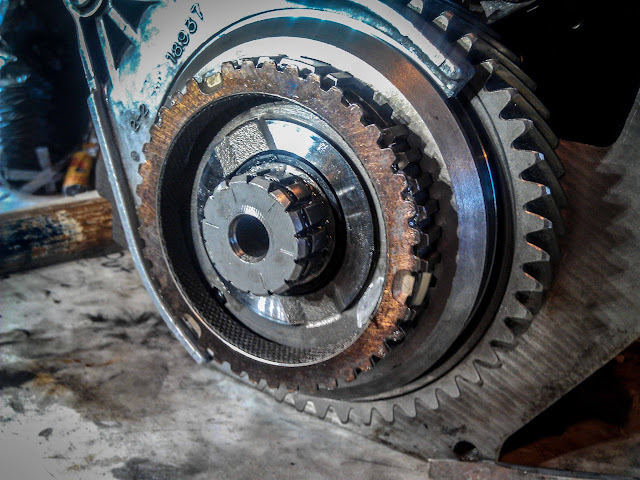 This first post may seem redundant for those who are far more experienced at transmission work or at turning wrenches in general, you can skip to the first picture if you want to jump right in. 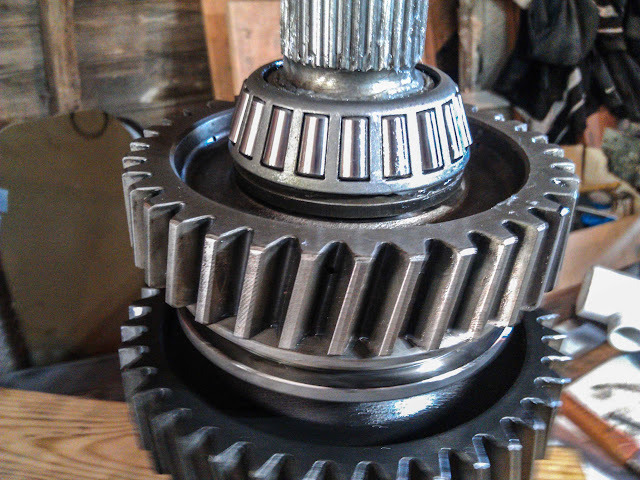 For issues involving fifth gear you can click here to skip ahead. The reason for this thread is because I found that my Chrysler rebuild manual was too vague and the manual from Quad4X4 had pictures that lacked sufficient detail. I recommend using the manual from Quad4x4(I used the PDF) with this how to. Dan's writing is much more detailed, has high resolution exploded parts views, torque specs and tolerances listed that will be needed. I also had to consult the Chrysler manual for a few things. Time for the generic disclaimer. Disclaimer: This is only meant to assist you when following step by step with a proper rebuild manual. Neither myself nor Cumminsforum shall be held responsible for any damages or injuries that may occur. This step by step we'll be starting from assembly, for disassembly we can start from the finished product and work our way tot he top of the thread, I'll post a link to the finished post when it's made. You can get away without buying a lot of expensive tools instead of spending close to 1,000 dollars or more on the recommend tools in the manual. I chose to improvise on most of the tools and saved a fortune. Last edited by crazyrunner33; 07-23-2012 at 11:21 PM. Make sure to have all your parts in order on a clean surface. 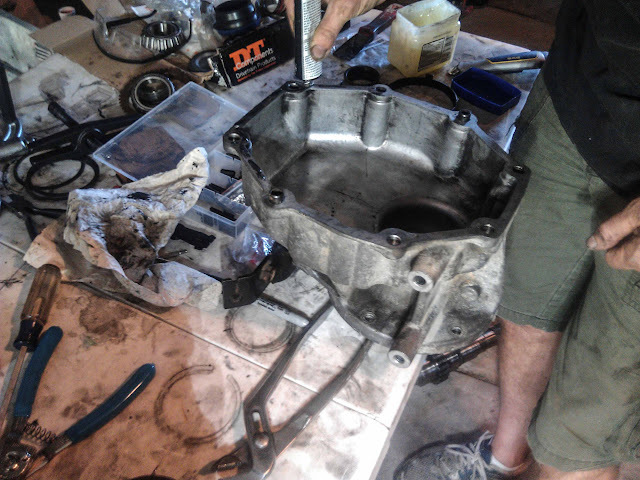 It's best to take it apart and lay the parts out in order when you disassemble. Sorry for the cell phone pictures, didn't want to bring out the DSLR with dirty hands. 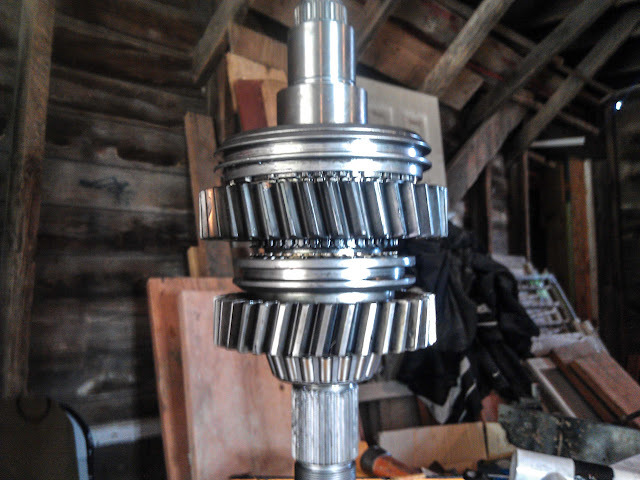 Start with the mainshaft standing up with the output/5th gear side standing up. 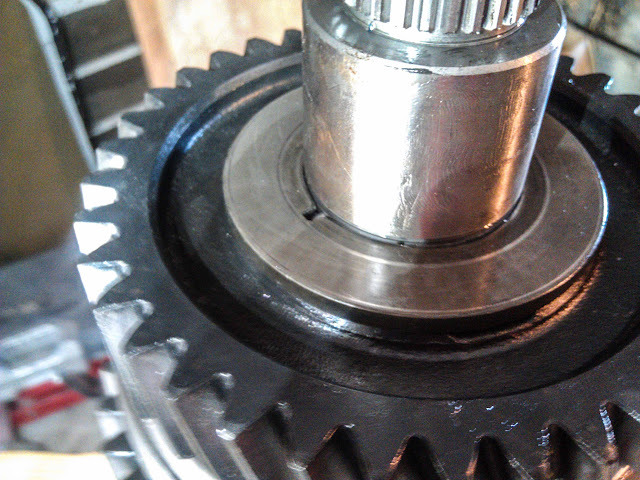 Then insert a lock ring in the second to last groove like show. 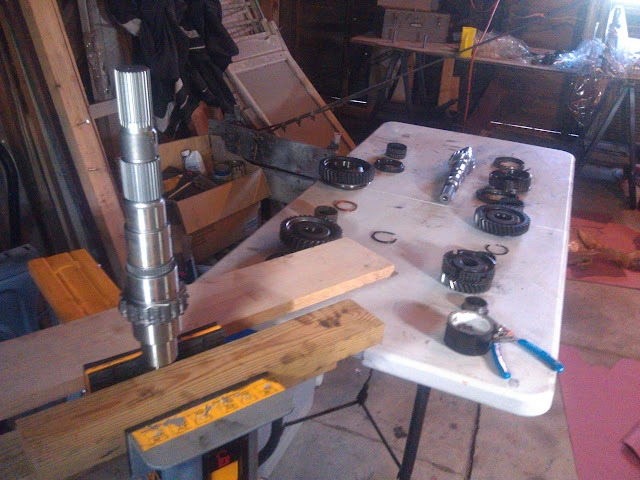 Assemble the 1-2 synchronizer hub with the 4 small springs and struts, then place the sleeve over the hubs and springs. This is what you're trying to obtain, all four need to look like this, it's the 3-4 syncro but it's similar to how the 1-2 should look. 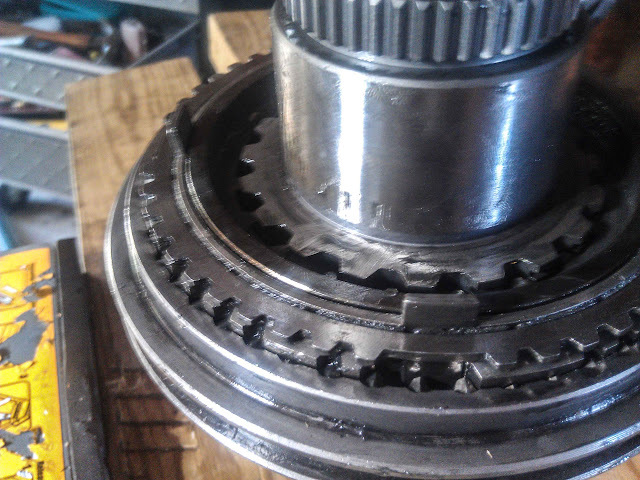 I ended up taking an old inner race from the mainshaft bearing cut a piece of card board to set the hub on. 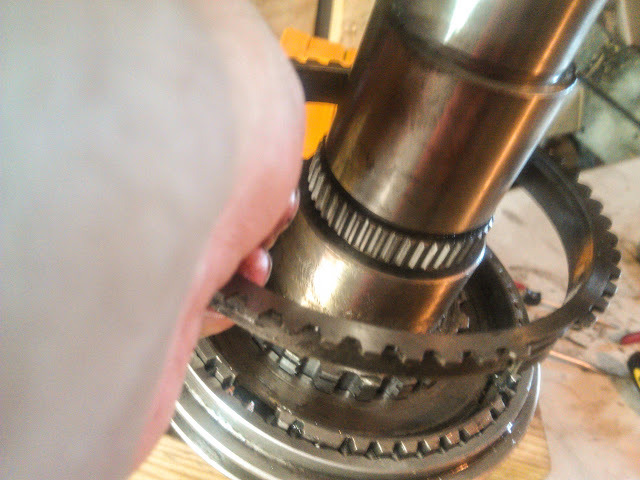 Then put the little springs in the little hole on the hub, there's gooves on the other side of the struts to match to push on, do this for all four and then slide the sleeve over the hub. It's tricky trying to get them all compressed and getting the sleeve over it. You can also see if you can put the struts on and the sleeve over, then try and fit the spring in with a tiny screw driver. I'm open to suggestions. 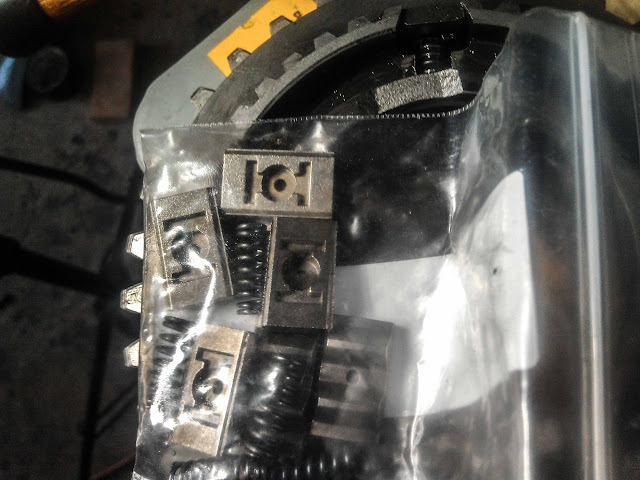 Note: It's easy for these springs to pop and shoot if you slip, working in a 100 year old barn with cracked floors is the reason I had to order more. Here's the 3-4 synchronizer assembly when looked at from the input side, you can see how the sleeve is over the 4 struts with the springs pushed in the hub. Place the next snap ring on. Then grab the inner synchronizer, the center one and the outer cone. Make sure to put Vaseline on the center one. Then place them on the shaft in order. Place another lock ring in the next groove. 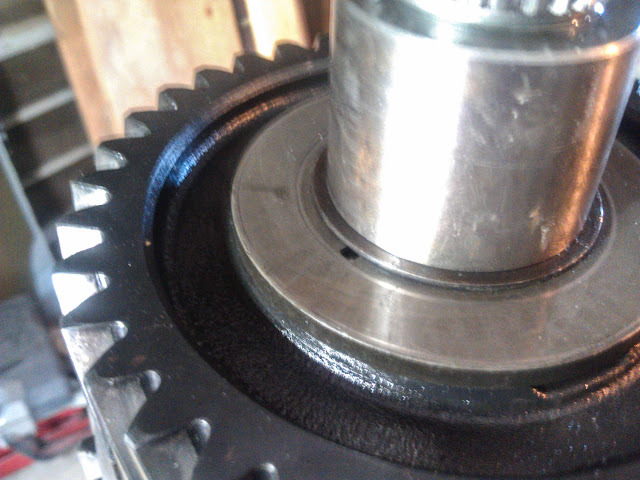 Put on the first gear needle bearing. 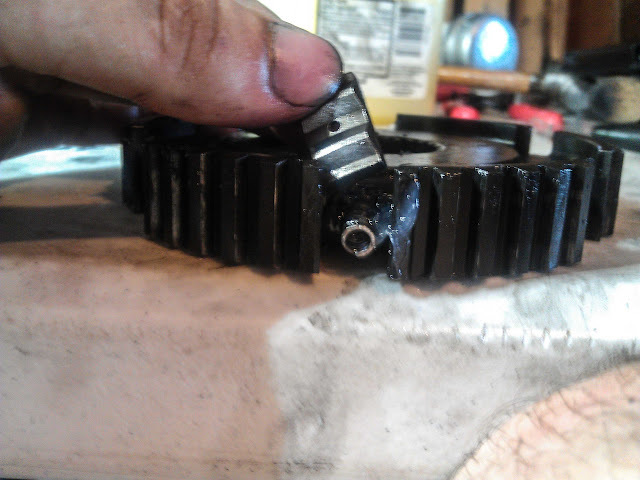 Place first gear over the bearing and line these tabs up with the tabs on the center synchronizer ring. 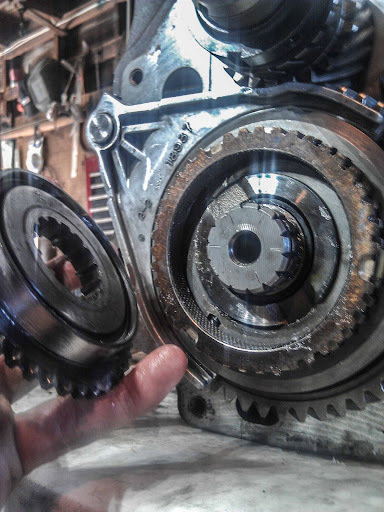 Make sure you grabbed first gear and not second, they will both fit on there. Count the teeth if you have to. 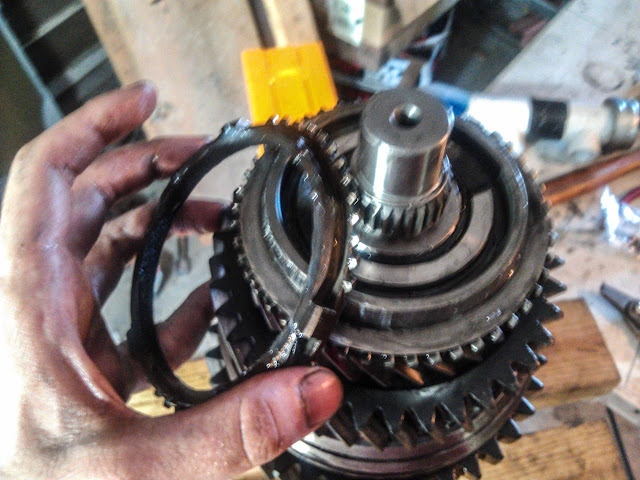 Time for the reverse syncro clutch. 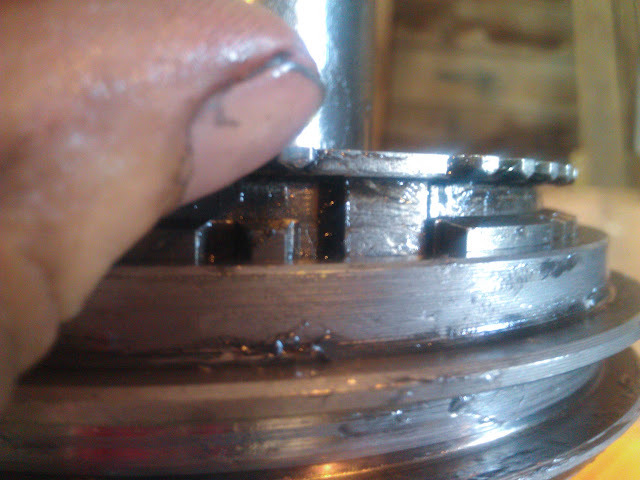 Clean up the teflon spacer and lube it up, then place it on next, followed by the reverse gear needle bearing. 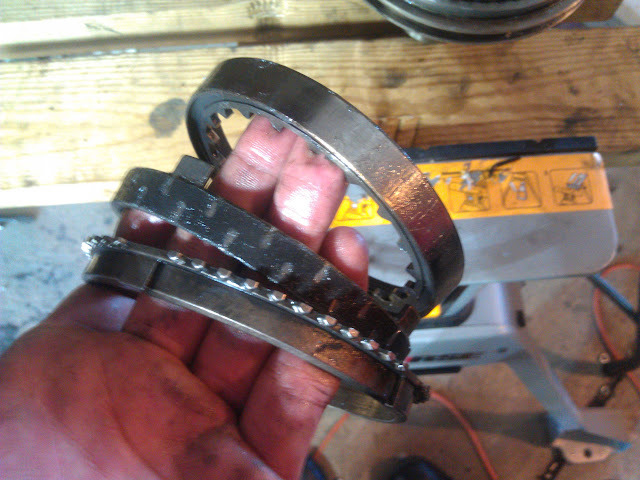 Put the synchronizer ring onto the clutch, make sure to lube it with Vaseline. Time to put together another synchronizer assembly together, these aren't nearly as bad as the first one we made. The big difference is that the struts and springs will hold themselves in place, they're also larger. 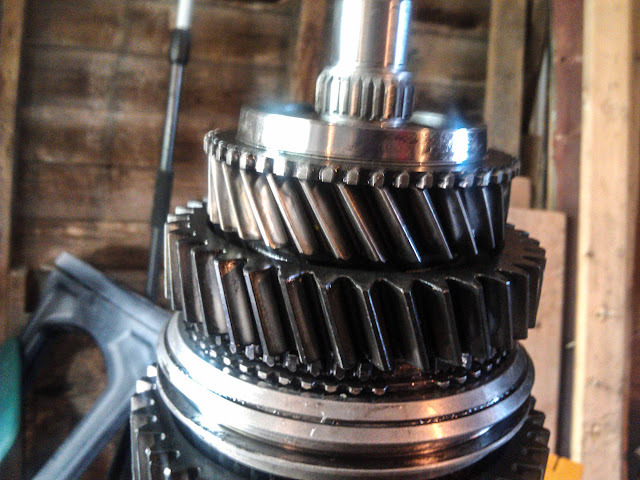 I'll show you step by step with the fifth gear synchronizer which is almost identical to reverse. The new struts and springs from Quad4x4. 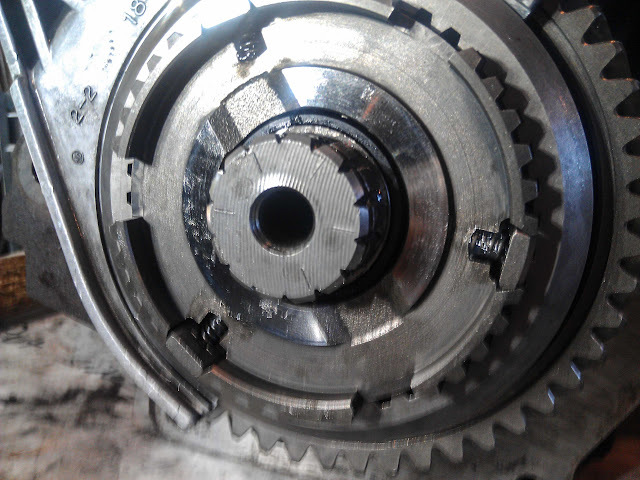 5th gear which is very similar to reverse. 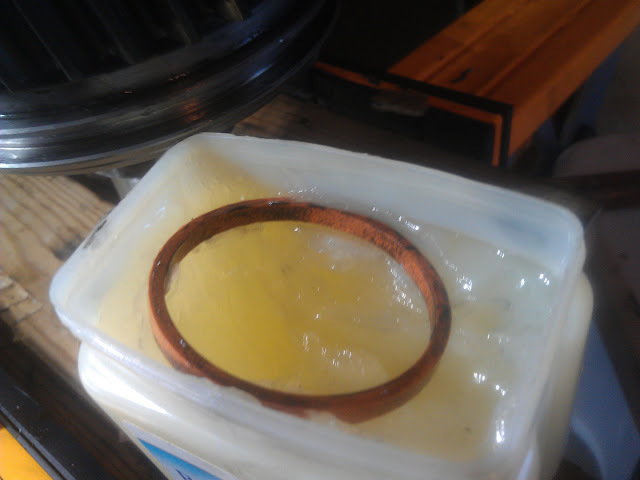 Use a lot of Vaseline to help hold the spring in place on the hub. 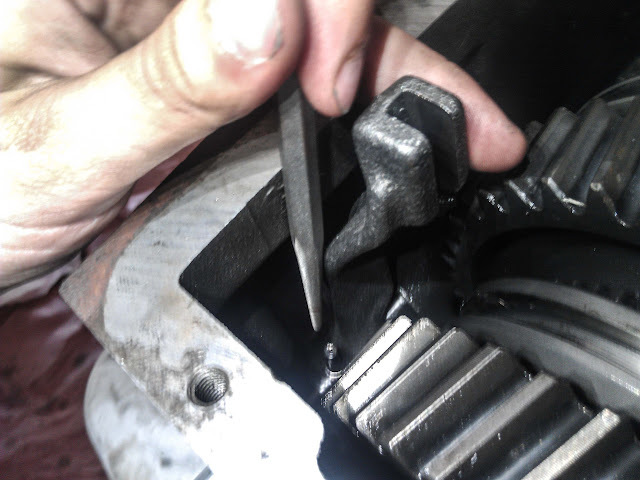 I then take a small flat blade screw driver that is the width of the spring, push in and slide the strut over partially. Then when the strut is on I use the screw driver to help set the spring where it's suppose to be in the hole, the tension will loosen up some and you'll be able to push the strut in and out a little. Once you get the first one figured then you'll have the learning curve down, fortunately reverse, fifth and the 3rd-4th assembly use the same size springs and struts. Last edited by crazyrunner33; 07-22-2012 at 10:36 PM. Slide the strut on and place the gear on the shaft and line up the tabs. It should now looks like this. Place the thrust washer on. 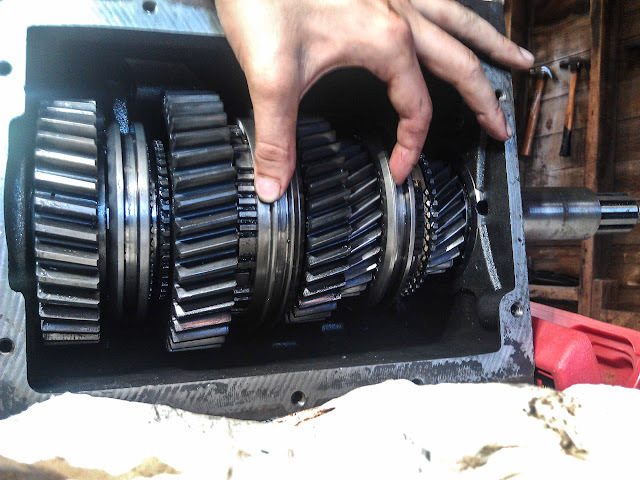 It's time for us to press the mainshaft bearing. 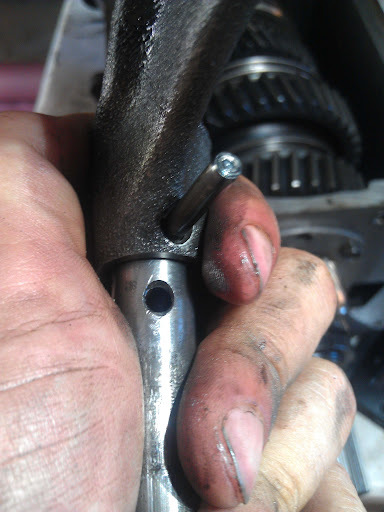 If you have a threaded mainshaft like the stock one then you can use the rod from the Harbor Freight puller, or a long bolt that fits. Then grab some PVC that'll go around the shaft but fit square on the race. Put a nut on the rod with a washer(or a few washers) that lead to the side of the PVC, then use wrench to keep the rod from turning and another one to turn the nut. Another way that works is to PVC and a large hammer, I was forced to use this way since my new mainshaft wasn't threaded. Here's what my father and I came up with. If you're going to use the hammer method then you really should use PVC and not metal. 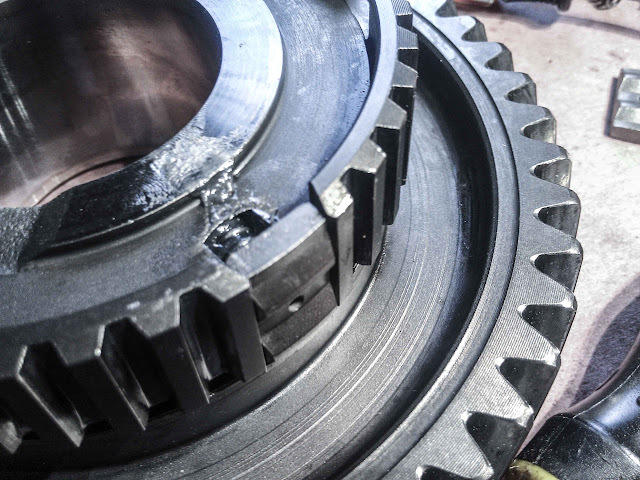 The reason is that PVC has a strong enough compressive force to press a bearing or two before coming apart while absorbing some of the shock force. To start off you should use a rubber mallet and tap the bearing on a little bit until it becomes square, it took us a few minutes. 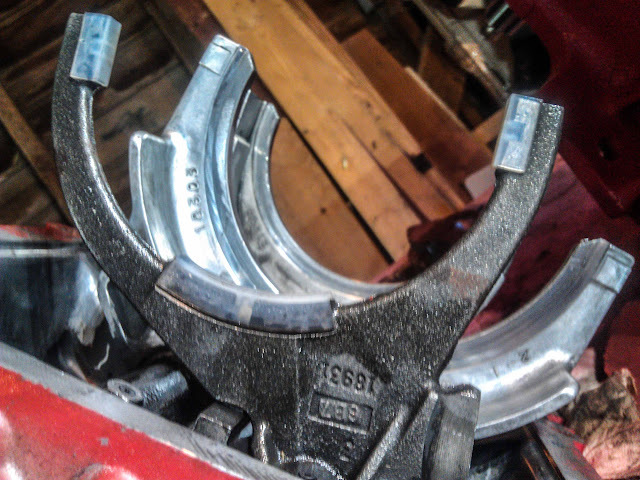 Every few taps I would use a small allen wrench to fit between the splines and go around to see which side was tighter, if it fits tight on one side that means the bearing is higher on that side, focus the force on that side. Once it moves about a quarter inch down and stays square we can then start going to town on it and move up to a bigger hammer. If the bigger hammer doesn't work then get an even bigger hammer. We ended up using the back of an axe. Press it all the way until it's hard on the thrust washer. 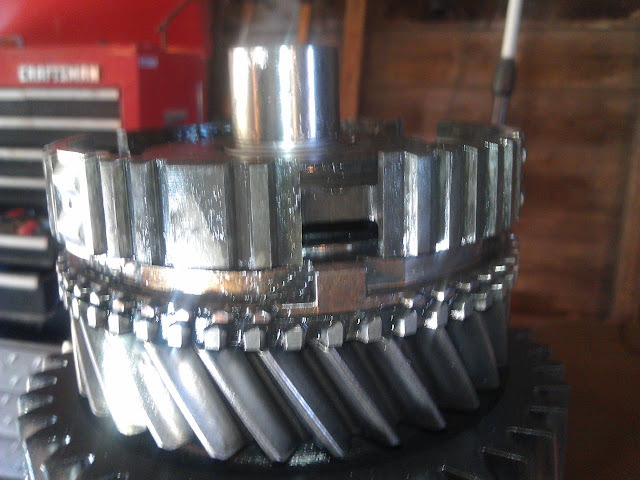 The first time I did this I left maybe a millimeter gap and as a result the shaft had zero endplay, the bearing needs to be pressed all the way down to give us end play when putting the shaft in the case, then we can use shims to get the endplay where we need it. Grab the inner, center and outer cone, identical for the one in the beginning of the build. They are identical to the first three we placed on the other side of the synchronizer. Place them on the shaft in order from left to right, make sure the inner one's tabs line up with the synchronizer. Lubricate the center one with Vaseline. You can double check the previous post for step by step pictures. 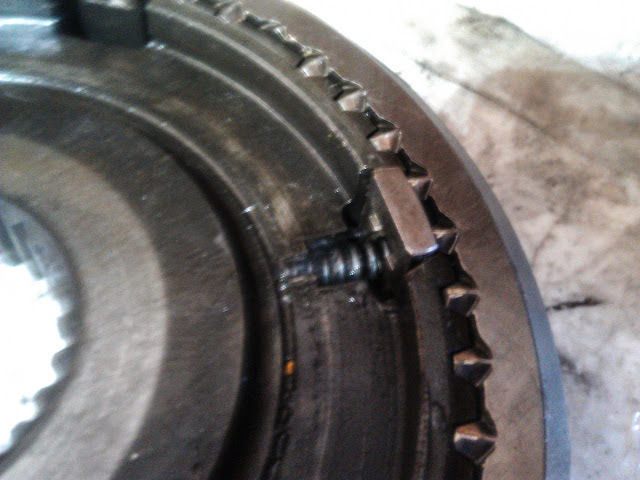 Put in the lock ring in the grove, you might need to press down on the cone a little to see the full groove. 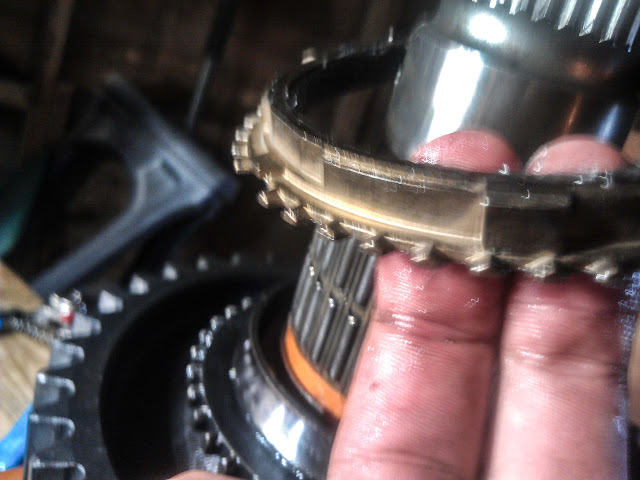 Lubricate the second gear needle bearing with Vaseline and place it on the lock ring. 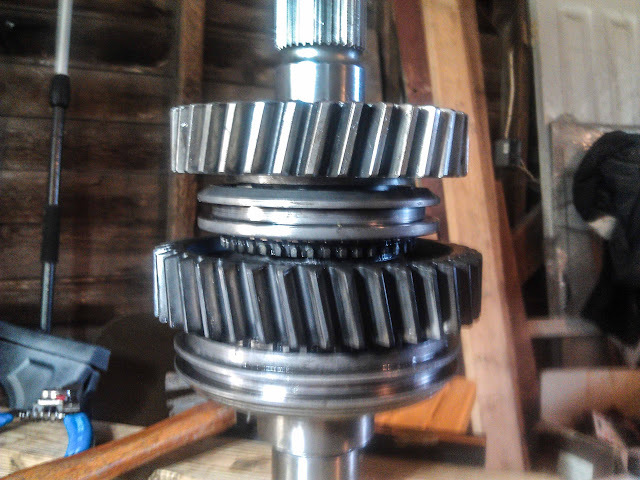 Install the second gear on the shaft with the slots lining up with the center synchronizer ring. 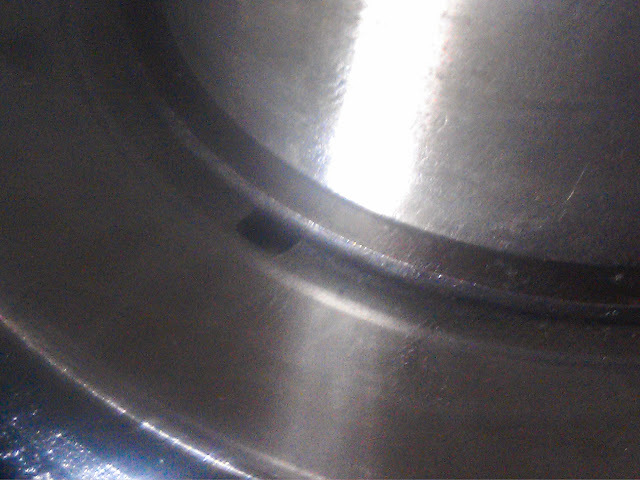 Put the steel pin in the hole for the thrustwasher. You can see where there'll be a snap ring after we install the thrust washer on. Place the thrust washer on, there's a slot for the pin on it. 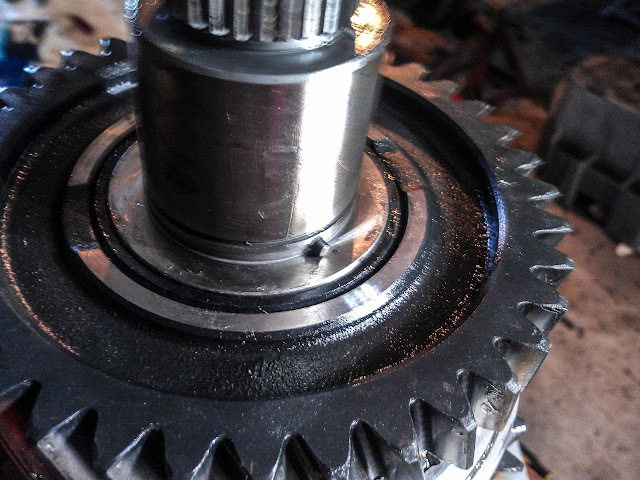 Place the third gear bearing on top the teflon spacer. 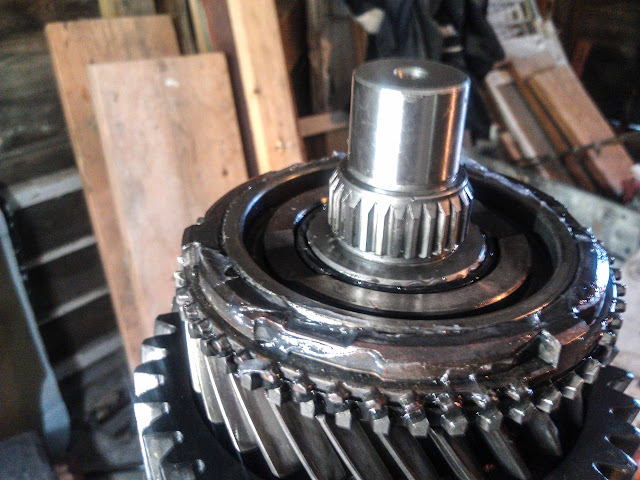 Place third gear on the shaft like so. Place the syncro on with Vaseline. 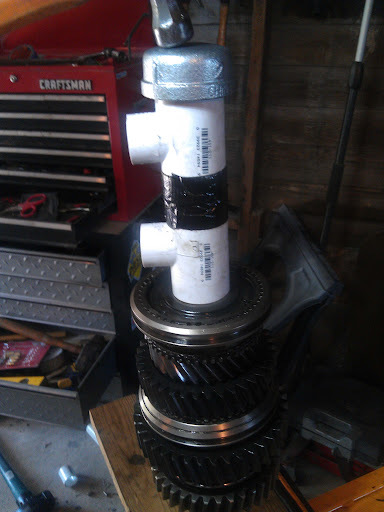 Put the springs and struts on the 3rd-4th hub. 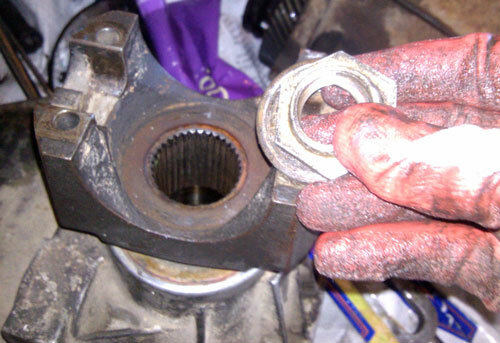 Place the sleeve over the hub, then look close on both sides of the hub. 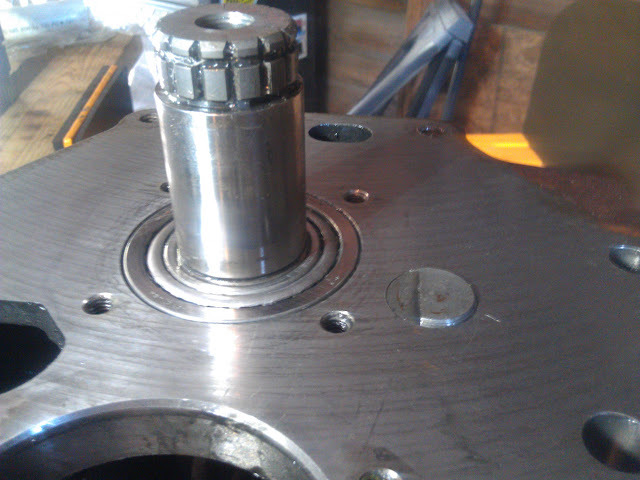 The side with the very small groove machined into the face is going to face up and towards where the input shaft. Last edited by crazyrunner33; 07-22-2012 at 11:14 PM. Now we need our trusty PVC and hammer. Press it the same way as described before, being gentle at first and using the allen wrench to tell which side is high. Make sure the tabs and slots are lined up. I removed the sleeve to see how the tabs are lining up, be careful when removing the sleeve to make sure the struts and springs won't take off for flight. 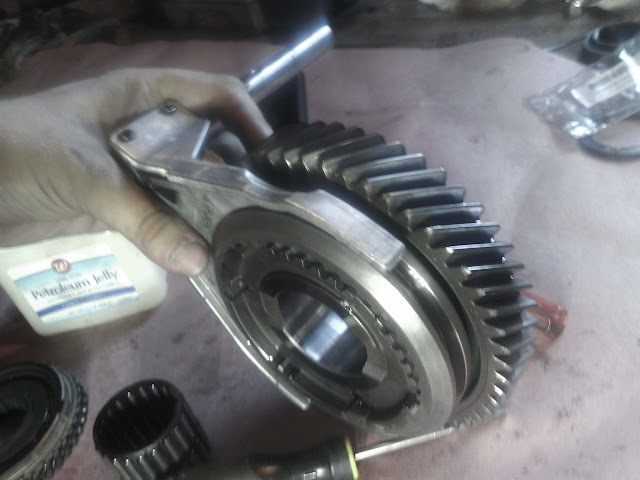 It takes a lot of force to press it down, I removed the sleeve to see how it's lined up with the To remove this assembly you can use a 3 jaw puller like the ones used for wheel bearings, just place it above the gear teeth. Be careful not to damage the teeth, I've heard of a few people damaging the teeth in another thread or forum. You can place the sleeve back on now. 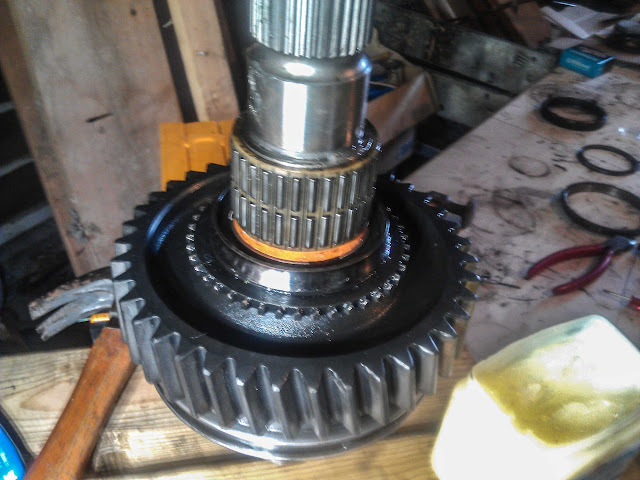 Now you can put the new bearing on the bottom of the countershaft, pry out the old bearing cup and put the new bearing cup in. 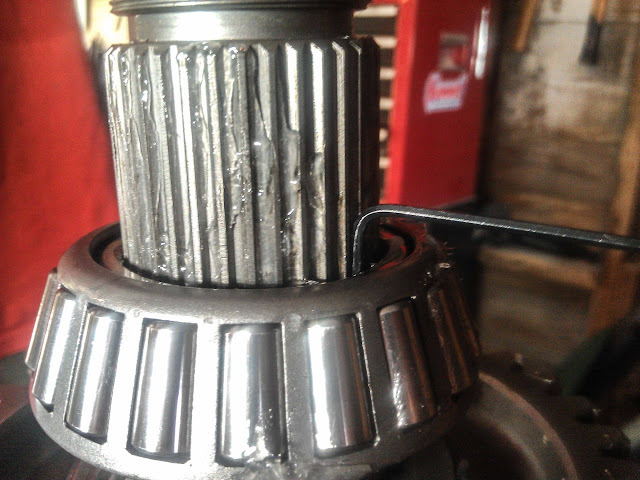 My transmission was rebuilt just before I purchased the truck, after looking at the bearing on the countershaft and seeing it was in good condition I decided to leave it on. 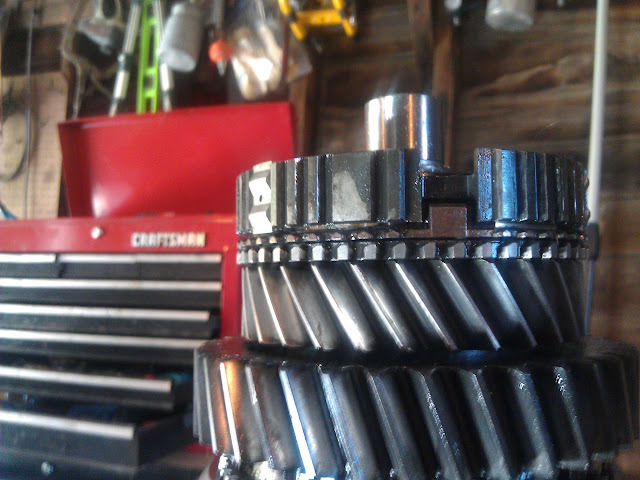 I plan on tearing the transmission apart in a year or two to analyze the wear and probably replace it then. I haven't put the block under the shaft yet in this picture. 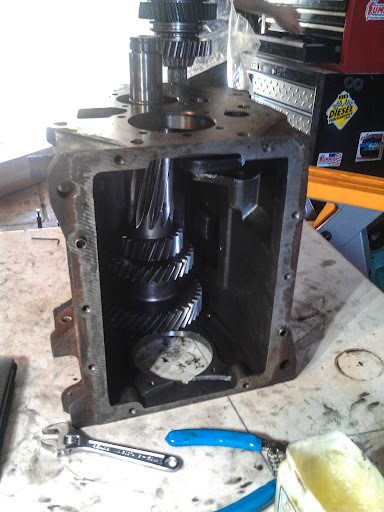 To put the countershaft in we need to first place a 1 inch board on the bearing cup so the shaft will sit out a little bit, this allows us to put the new bearing on on the countershaft, we need to put the bearing on with the shaft in the case. 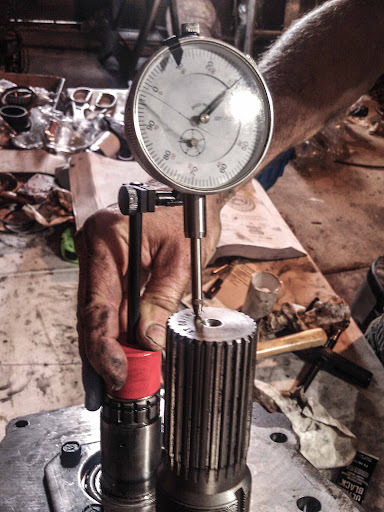 At this point we should be good at pressing stuff with our redneck presses. 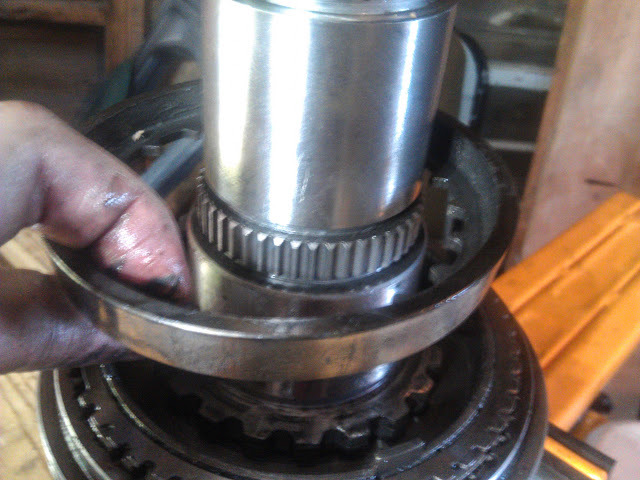 Press the bearing all the way down. 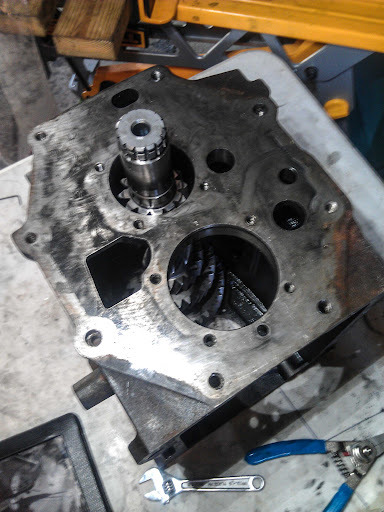 Once the new bearing is on we can take the block out from underneath, then rotate the shaft to make sure bearings are seated in the bearing cup on the bottom. 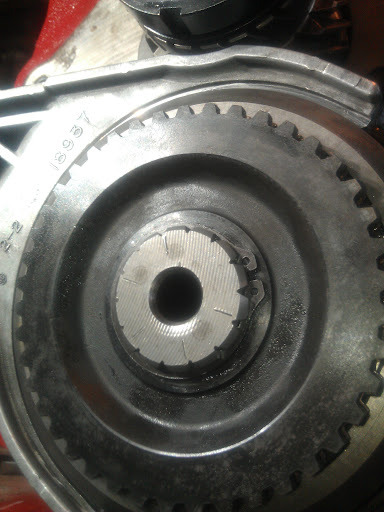 Grab the reverse gear idler, the shaft, the two identical washers and the bearing. 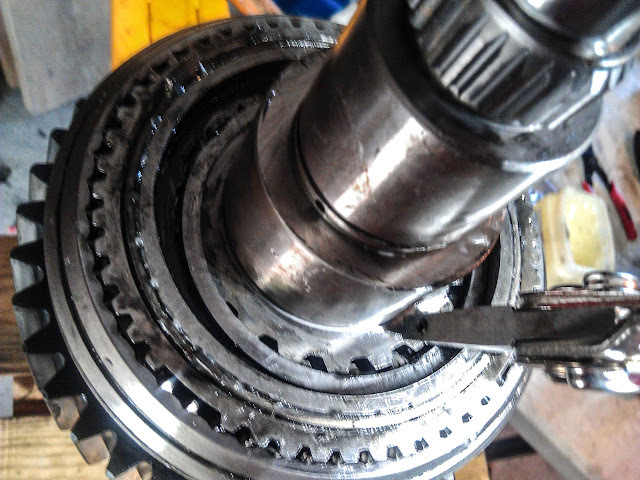 You can kinda see the bearing in the picture. Insert the shaft with the machined edge outside of the case. 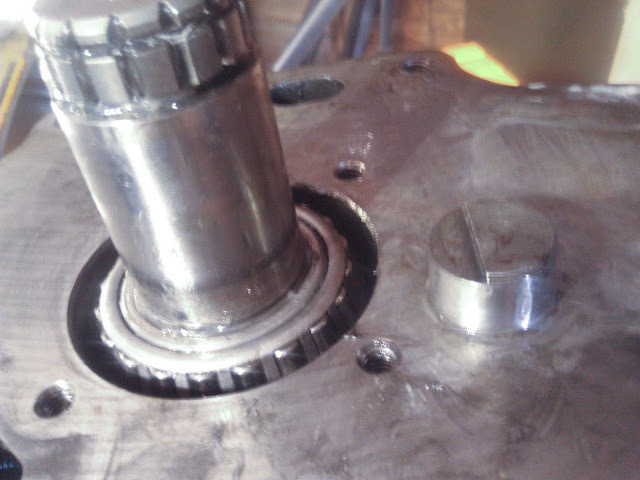 Play with the idler's position until you can get the shaft to slide down with the machined side flush against the case. 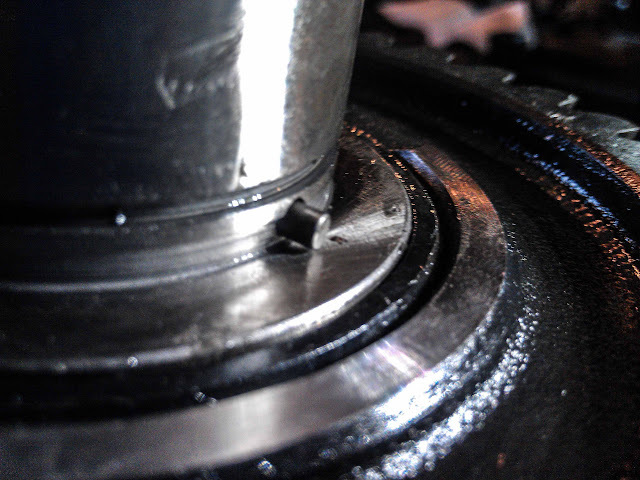 Also place the countershaft rear bearing cup on the bearing, you can see it's also added in this picture. 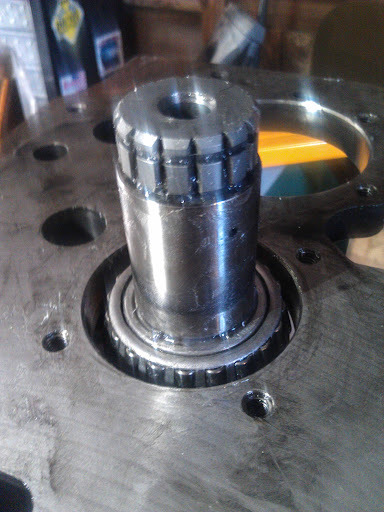 Put the countershaft plate on and line up the machined edge on the idler shaft to the edge of the plate, this keeps the shaft from rotating. 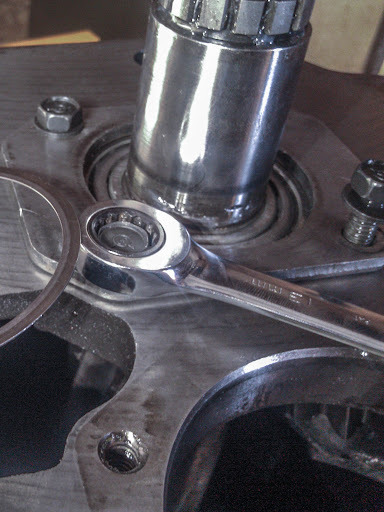 Then bolt down the four bolts to the proper torque specs listed in the rebuild manual of your choice. 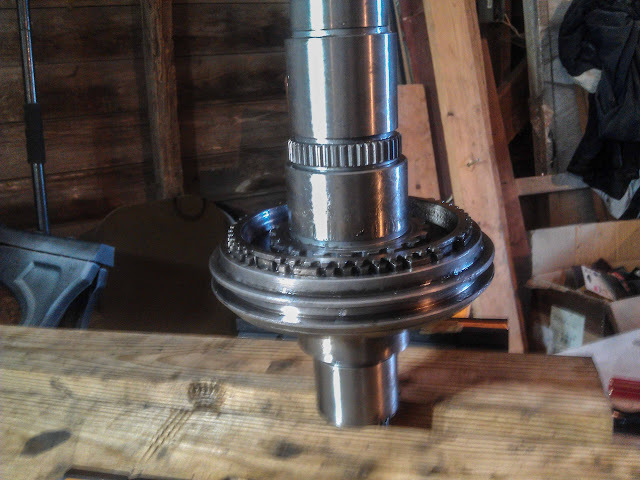 Spin the shaft to make sure the bearings are seated. Now we need to check the endplay, place your dial indicator on the shaft. You don't need to zero it out, you can just observe how much the dial moves from it's original position. 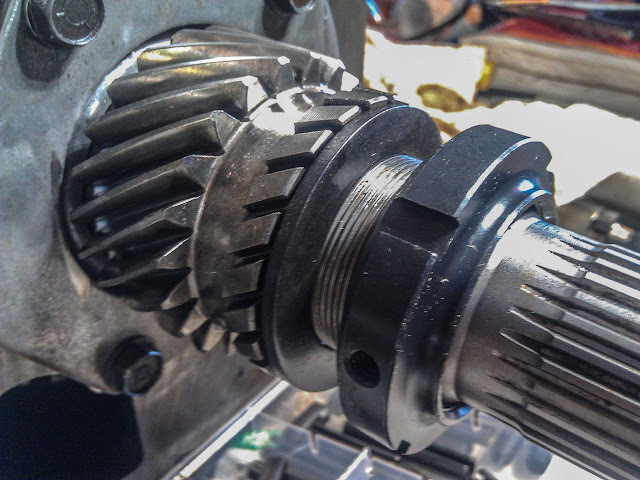 Place a long flat blade screw drive under the gear and wiggle it up and down, you need 0.002" to 0.006" of play, preferably closer to 0.002". 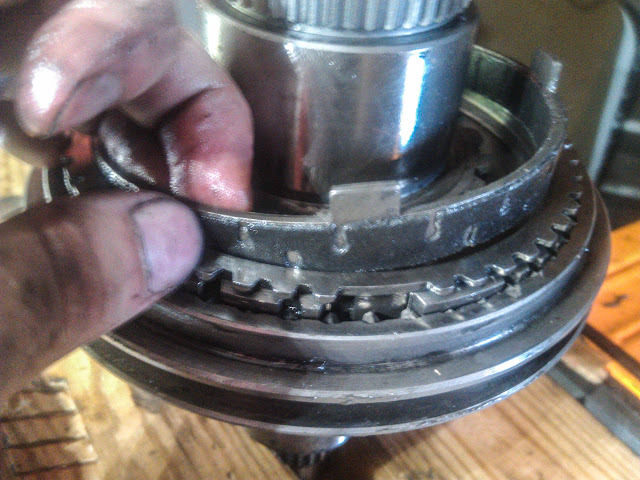 If it has zero play then the bearing probably needs to be pressed on more. If there's too much play then we'll need to try a few different shims until we reach the desired play. 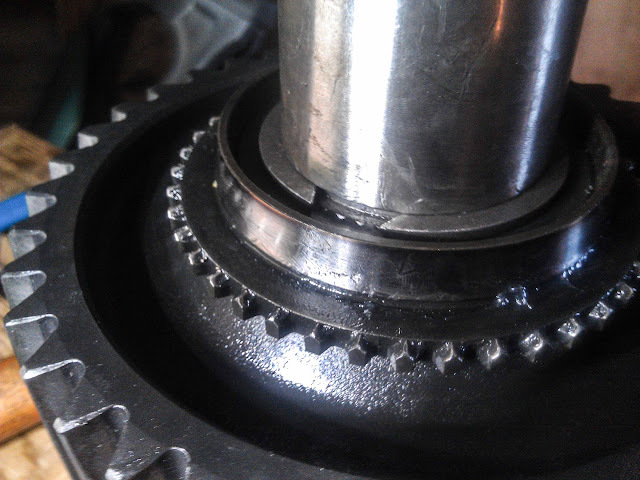 The shim is just a spacer that is placed on top of the bearing, when you bolt down the plate over the shim the end play is reduced. 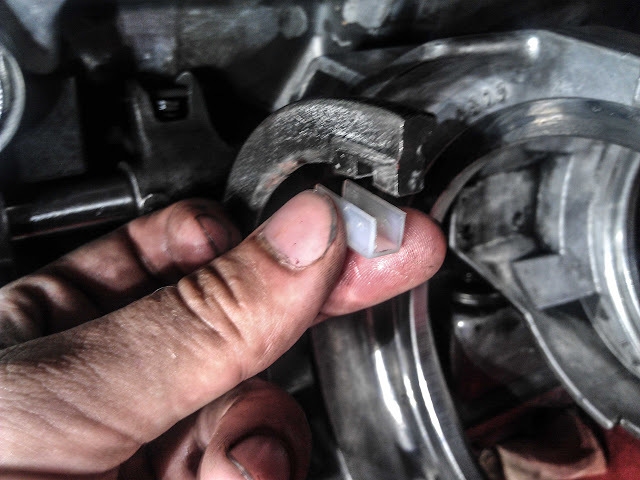 Here is the plate being removed to put in the new shim. The mainshaft will have more pictures on this. Once we're close to .002" of play then we can move on. 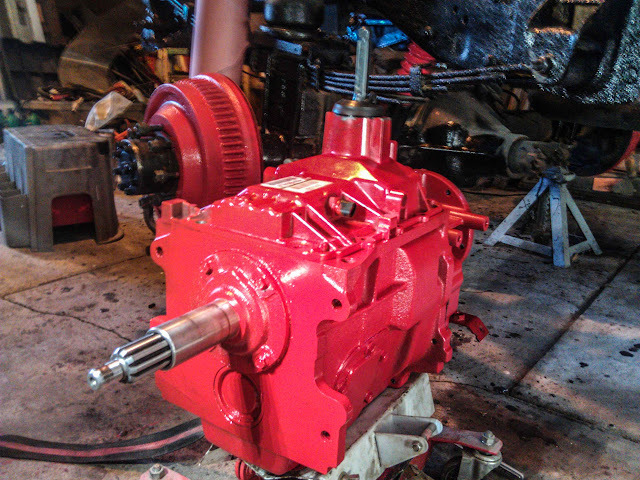 We can now put the mainshaft in, we shouldn't have any issues placing it in the transmission. 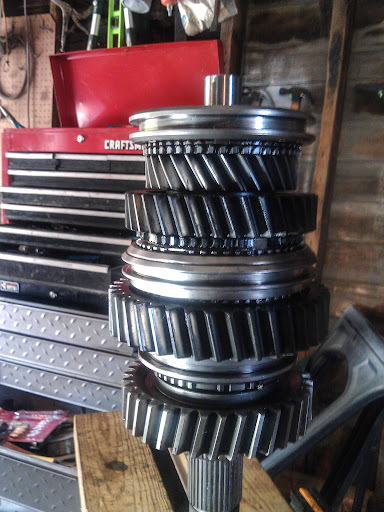 Now we should have something that looks like a transmission. Now we can grab the clutch and synchronizer ring for third-fourth. Lubricate this with petroleum jelly. Line up the four slots and pull back the sleeve of the synchronizer to hold the clutch and ring into place. Grab the pancake bearing and lube it up with Vaseline. Place it on the shaft. 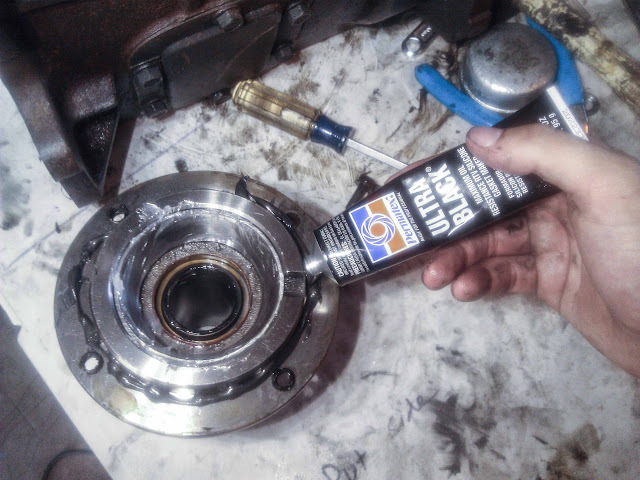 Lube up the pocket bearing for the input shaft with Vaseline and either place it on the mainshaft or in the input shaft, it'll work either way. 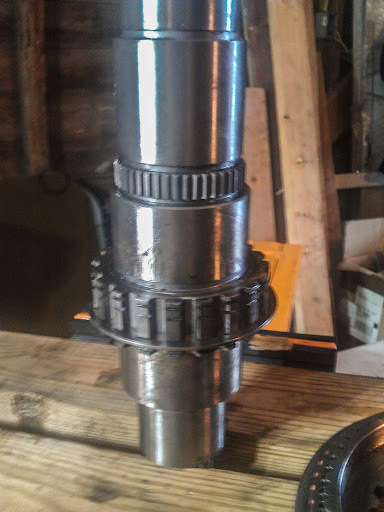 Here's the pocket bearing on the mainshaft. 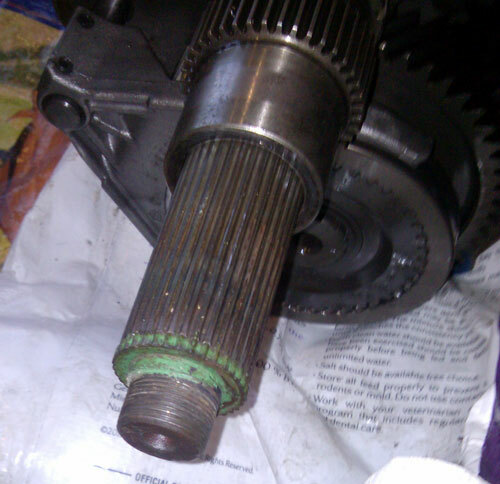 And a picture of it in the input shaft. 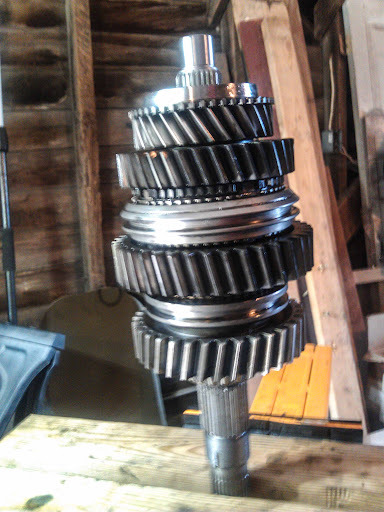 Put the inputshaft in like a puzzle piece, it might take a moment to get the input shaft to slide in. 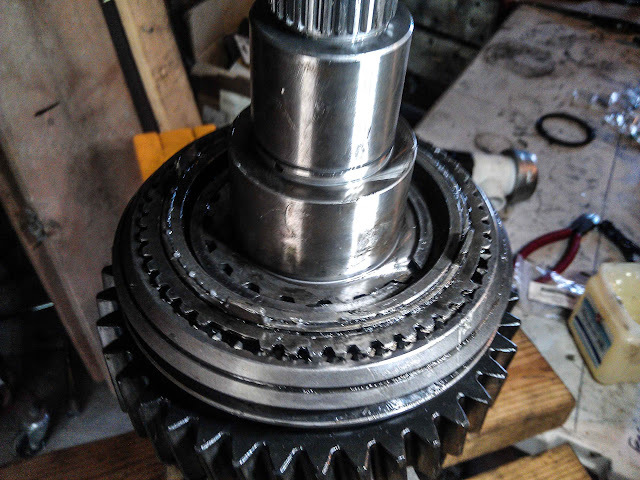 Then take the input shaft cup/cover and put some RTV on the surface that mates against the case, let it dry for about 5 minutes and put it on the case. 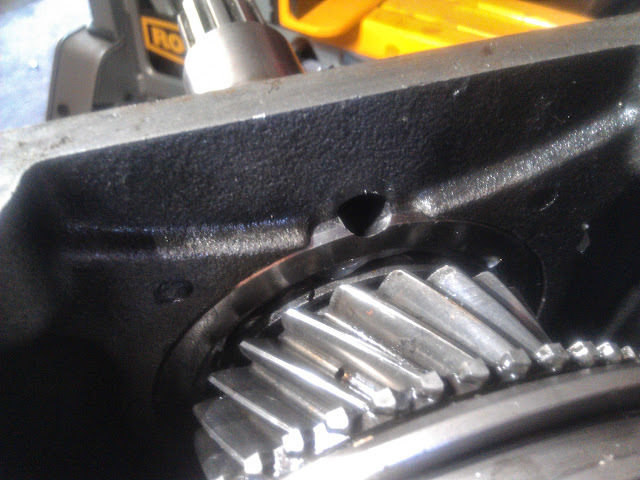 There's a hole for lubrication to go through the cover, make sure it's facing up. 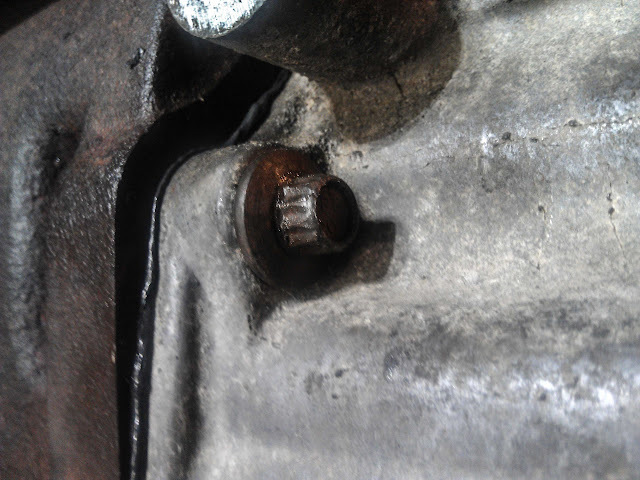 Bolt the cover on with the four bolts and make sure RTV isn't blocking this hole. 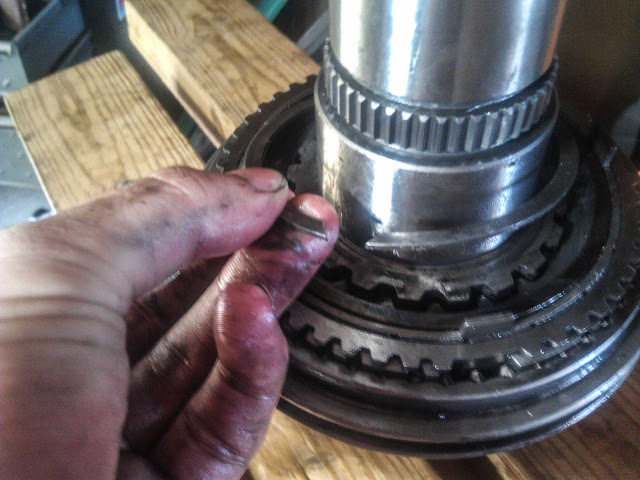 Put the mainshaft bearing rear cup on with Vaseline. 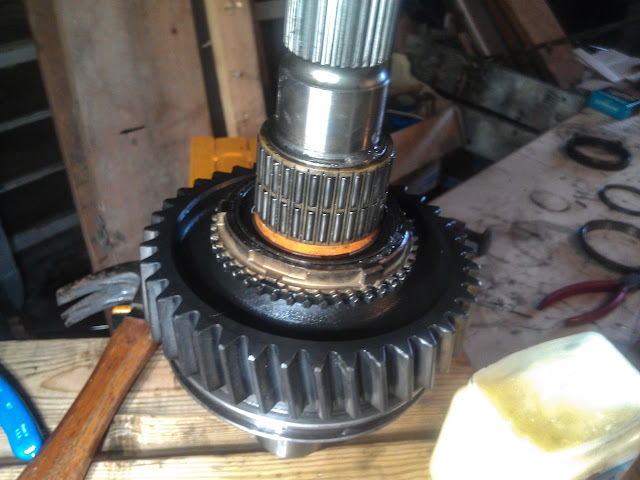 Put the cover over the mainshaft bearing, you only need four of the five bolts in. Pull the dial indicator and magnetic stand out again and try to achieve an endplay of .002" to .006." Try out a few different shims if you have too much endplay. Put the cover back on and check, if we're in the ball park then we can move on. If not we need to keep trying until we are close to ".002." Last edited by crazyrunner33; 07-23-2012 at 12:10 AM. 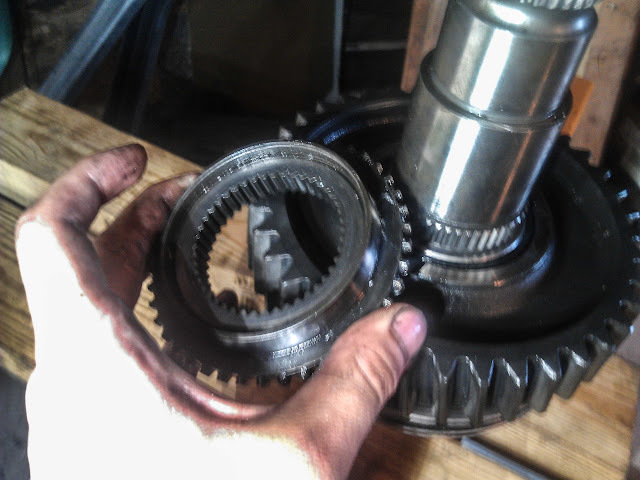 Put fifth gear back on the mainshaft. You should have to press it on, just use the redneck PVC with hammer or the bolt and PVC method. My new shaft was unfortunately a slip fit and the gear slid on, this is why the new shaft wasn't tapped. 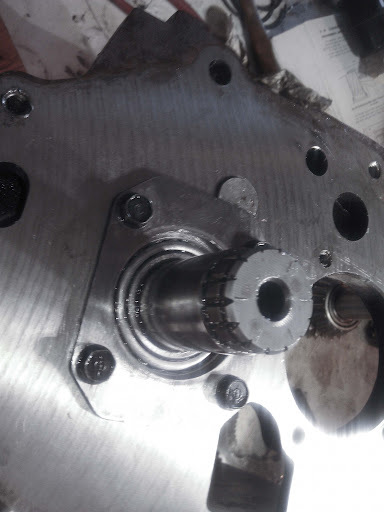 With the stock shaft and the Torque King shaft from quad the shaft is threaded and fifth gear is a press fit. 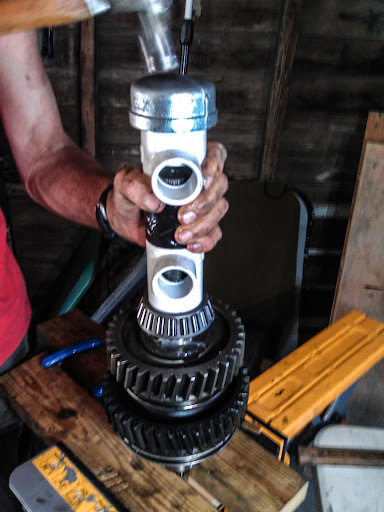 After putting the gear on I needed to clean the end of the shaft. 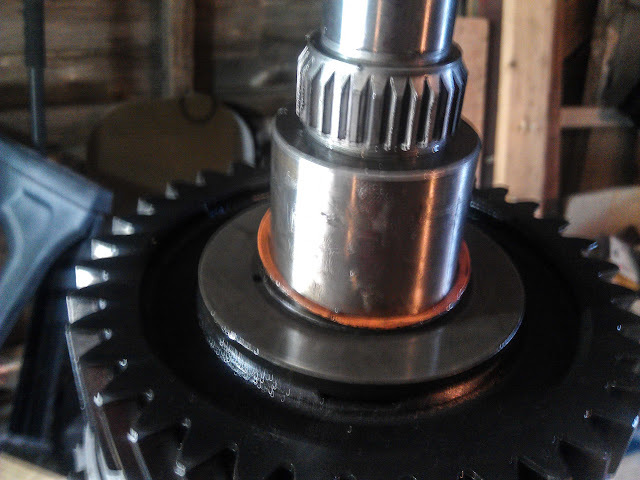 Push the sleeves of the 1-2 and 3-4 synchronizer together like this to lock the shaft so we can torque down the fifth gear nut. 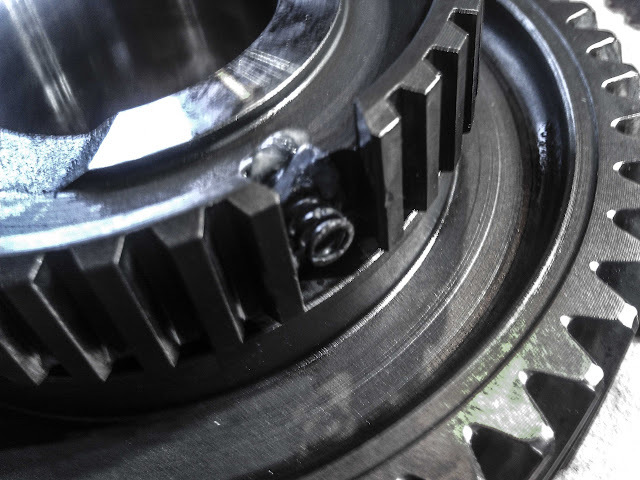 Grab the new fifth gear nut and tool from Quad and torque the nut down with a torque wrench to the indicated spec of the manual you're using. Make sure to put Permatex on the threads. 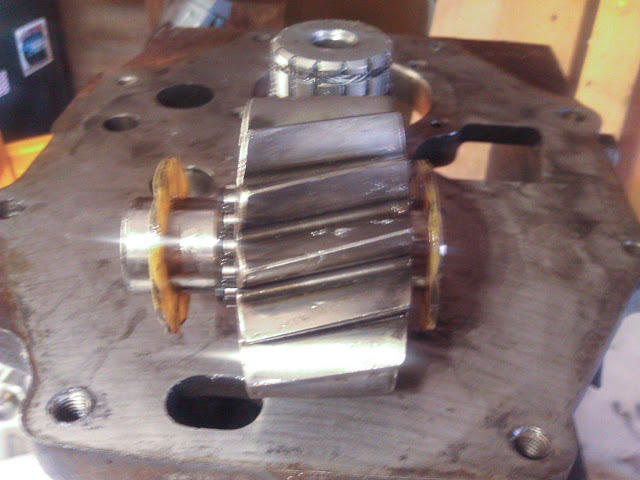 Go back to the countershaft on the back side and place the pin in the shaft and the thrust washer. 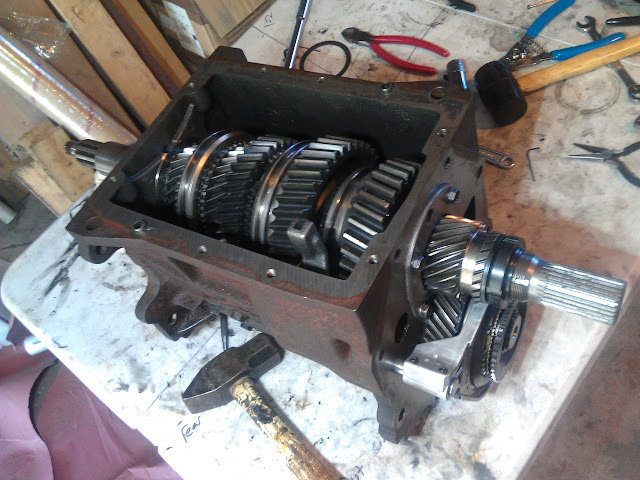 Assemble the fifth gear synchronizer, the same as reverse and the fifth gear was demonstrated for reverse earlier in the how to. 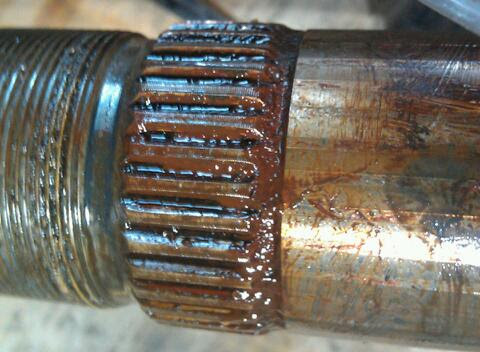 Slide the fifth gear fork over the sleeve. The shift rail from the above assembly will go into the case through this lug, here's the lug on the outside so we can see how it attaches. 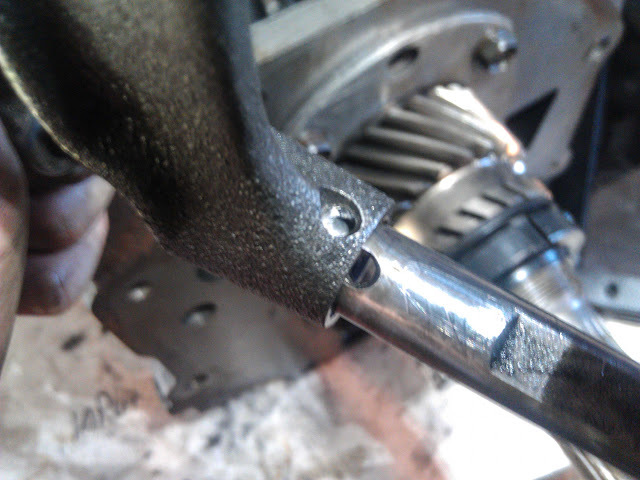 A roll pin will be punched through the lug into the rail. 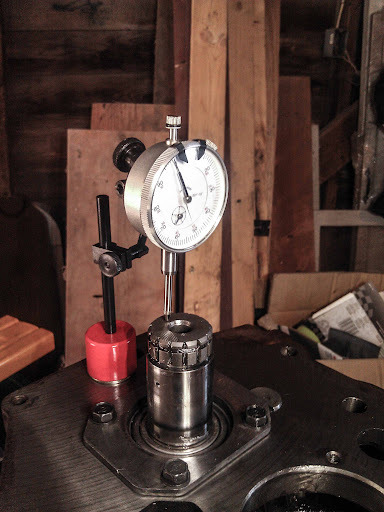 Get the roll pin to sit partially into the lug and place it in the case and start working the rail through the case, place fifth gear over the countershaft with the needle bearing that has been lubed in Vaseline. 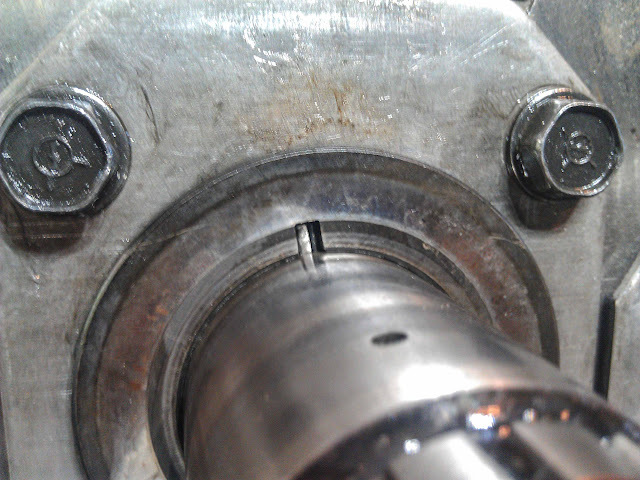 Use a punch to drive the roll pin in until it is flush against the surface. For removal you just drive the roll pin all the way through. 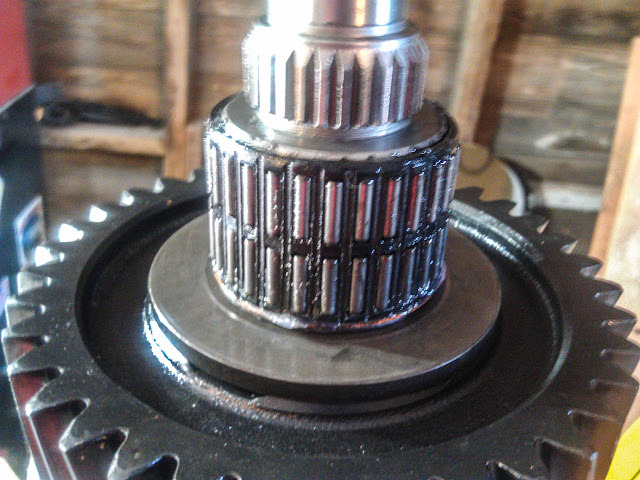 Fifth gear should look like this on the countershaft. Put the synchronizer ring on with the slots lined up. Lube up the clutch and place it on there. 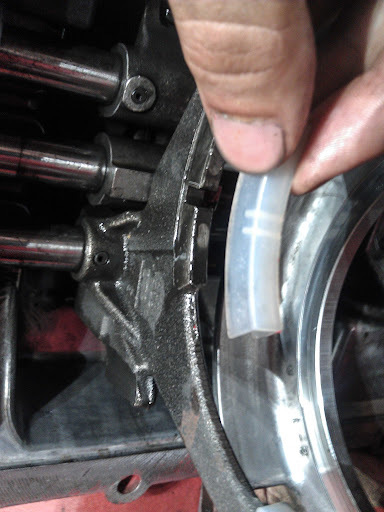 Put on the snap ring, make sure to examine it closely and have the sharp edges facing out. 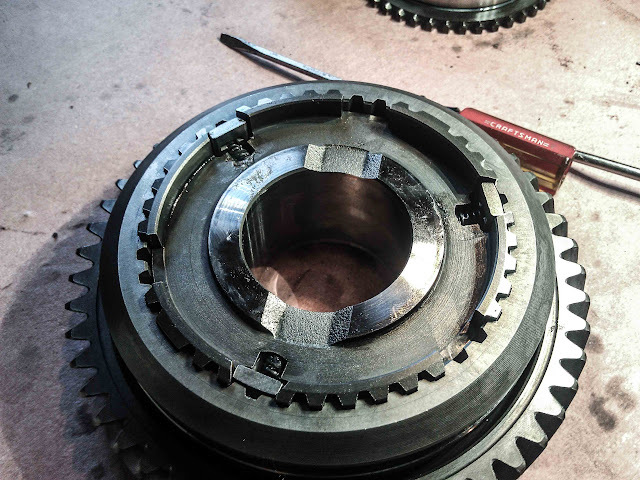 It isn't uncommon for a fifth gear failure to occur due to the ring facing the wrong direction. Put some RTV on the housing and install the bolts housing after letting the RTV dry for a few minutes. 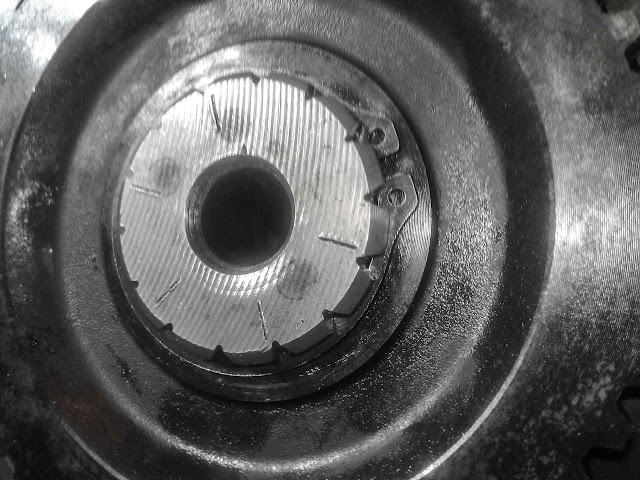 Use a 12 point 10mm deep well socket with a 3/8" drive, not a 1/2" drive. 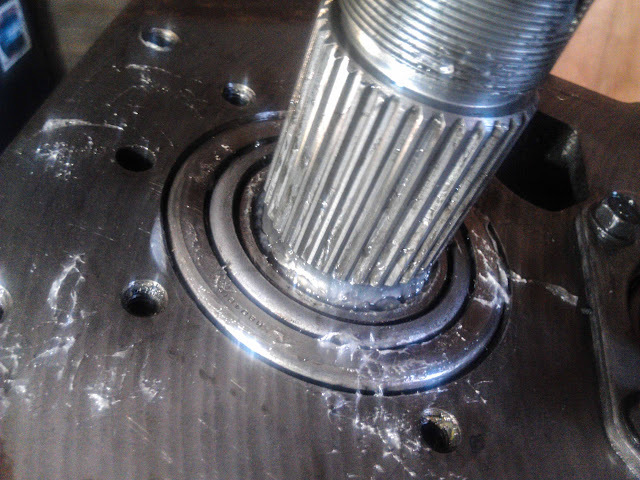 With the half inch drive the socket becomes two wide and is worked at a slight angle for some of the bolts, this is how I rounded one of the bolts which required welding a nut on to get it off. Put on the three new reverse for pads on the shift tower. Put RTV on one of the mating surface for the shift tower, place the shift tower into neutral and put the tower into place after the RTV dries for a little bit. 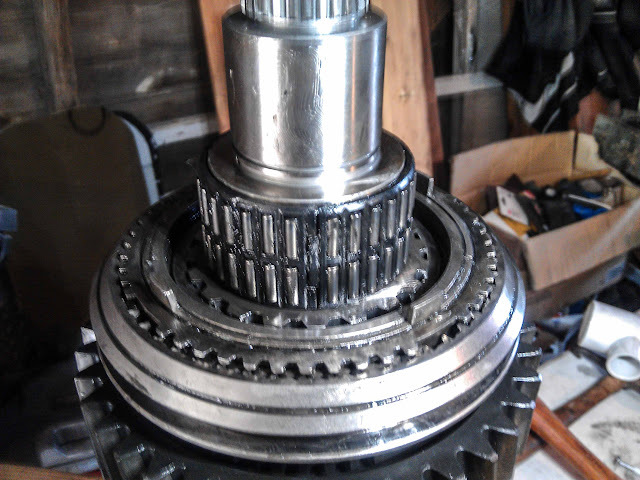 Bolt the shift tower down and check to make sure all the gears are shifting fine and the shaft rotates for every gear. If so then congratulations, we just built a transmission! Last edited by crazyrunner33; 07-16-2013 at 11:47 PM. 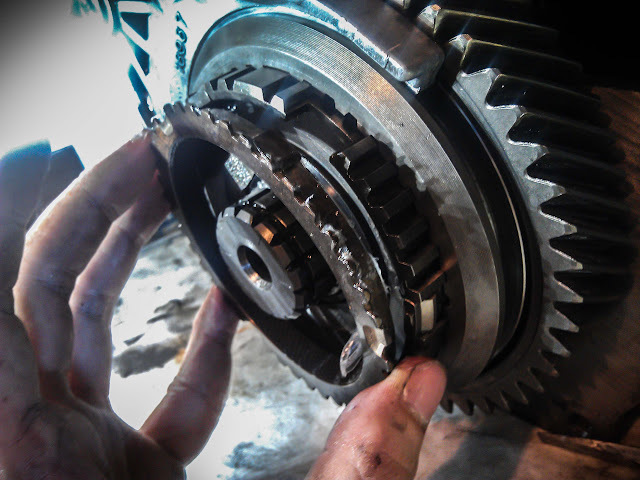 A lot of people have lost fifth gear. 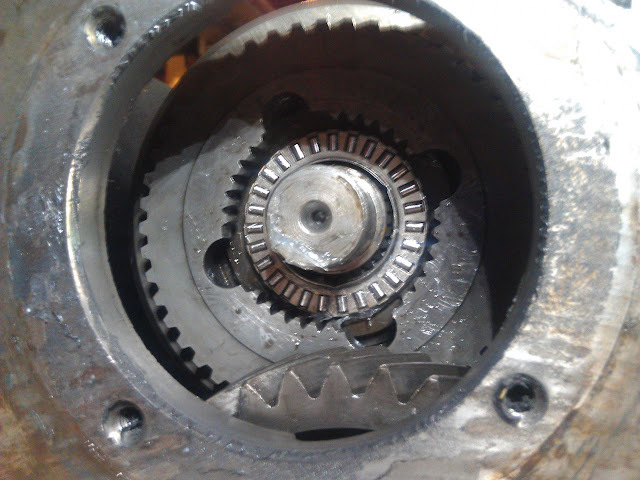 When fifth gear is lost it usually is a result of the nut on the back of the mainshaft backing off and fifth gear then slides off. 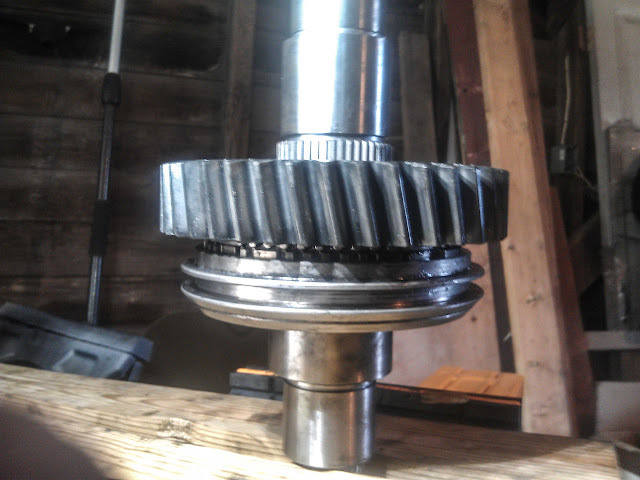 Here's the fifth gear nut when being placed on the shaft, with the gear off it could look similar. 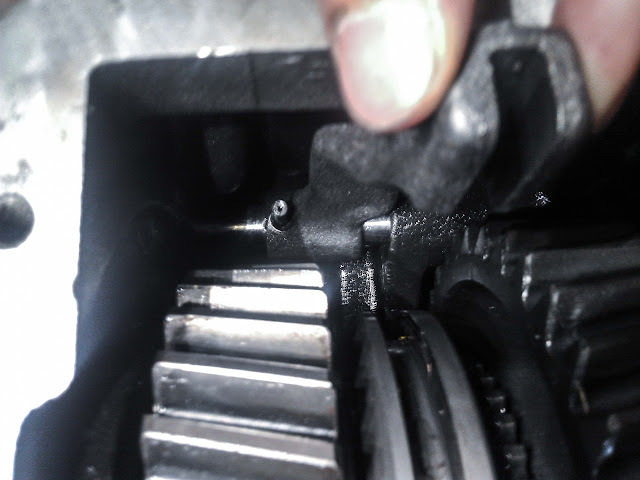 Take a look below the mainshaft and look at the counter shaft and check to see if this snap ring is missing, if so then the synchronizer will slide back and fifth gear will not engage. 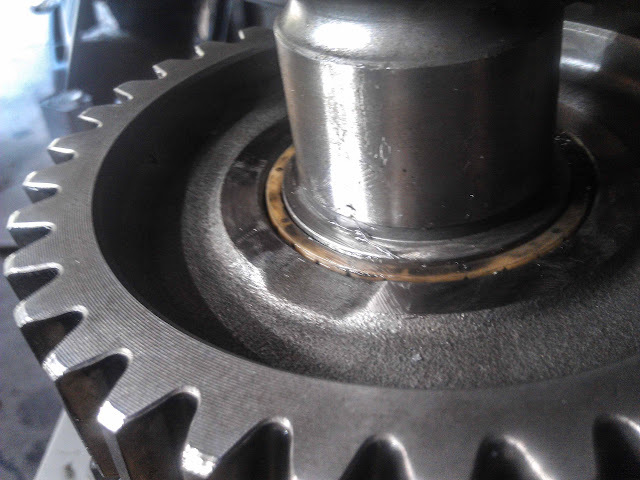 If the snap ring is still there then there might be damages to the syncros or the fifth gear. There could also be an issue with the springs or struts. 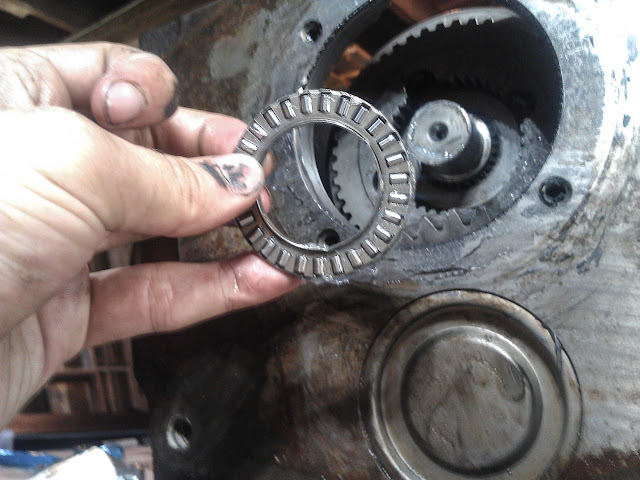 After taking the snap ring off there's two pieces that'll slide off, the clutch or synchronizer ring. Take them off like so and check for damage or missing teeth. 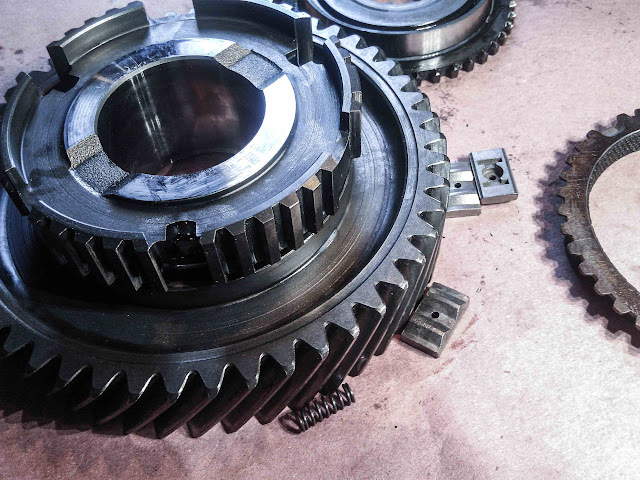 Look at the hub and the gear itself along with the sleeve for damage, also check to see if the springs and struts are in place and that the springs are seated properly. 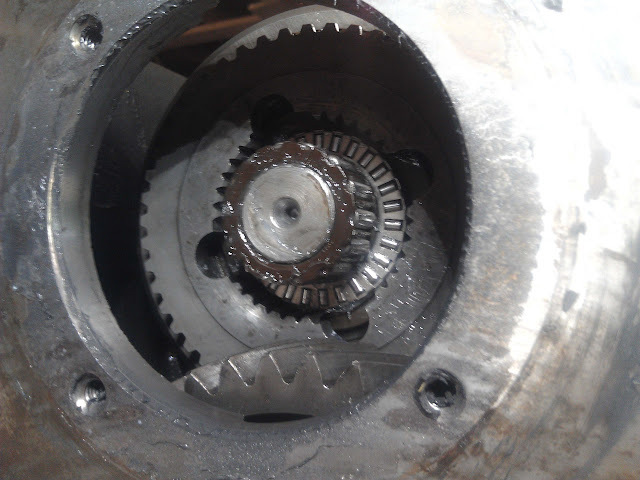 Here's the problem with 5th gear and the mainshaft. 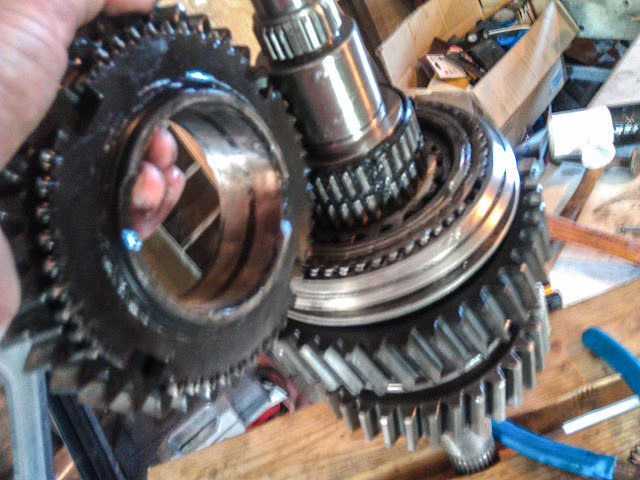 This transmission was rebuilt not too long before I purchased the truck which was about 15,000 miles ago. 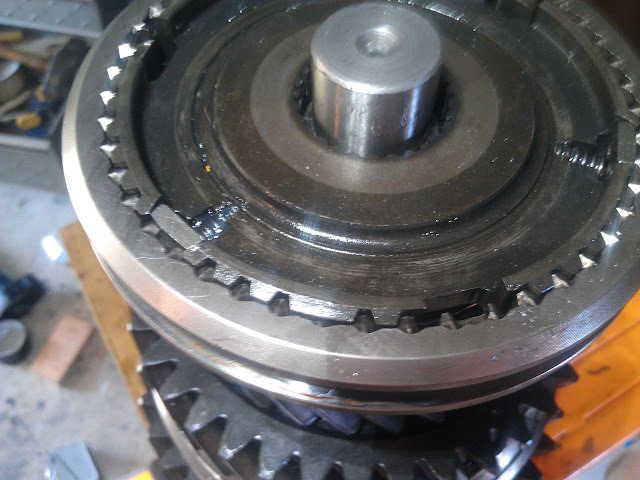 The shaft isn't fully splined for the fifth gear which is a problem which can be seen in this picture. 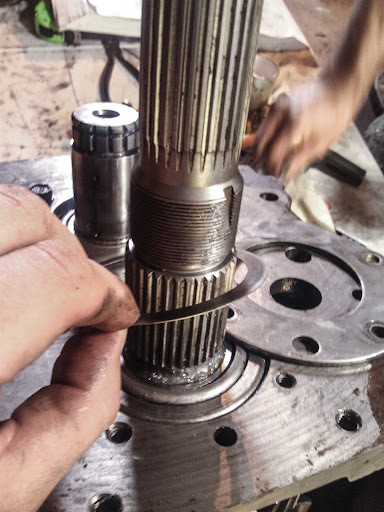 The gunk that we see on the shaft is rust from metal shavings, obviously there is wear due to the shaft not having enough surface area for the spline. 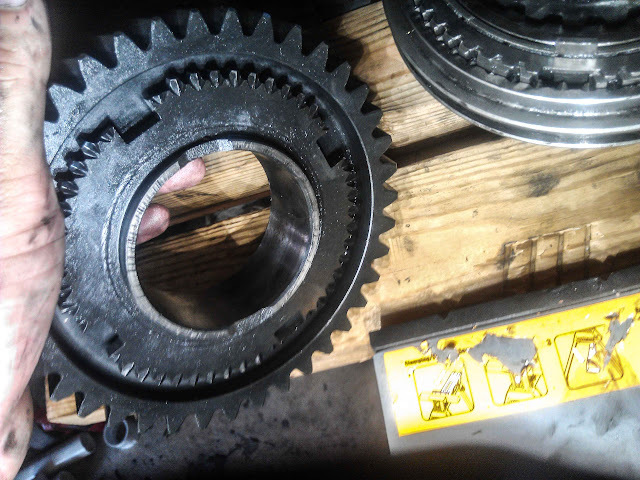 From what I observed the previous owner towed very heavily and liked to accelerate from low RPM in fifth gear, the excess vibrations at the low RPM with the amount of low end torque our trucks make will accelerate this kind of wear. 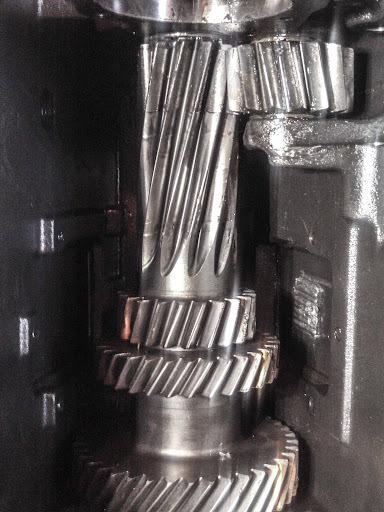 We can also see indentations on the mainshaft on the unsplined section from this gear. 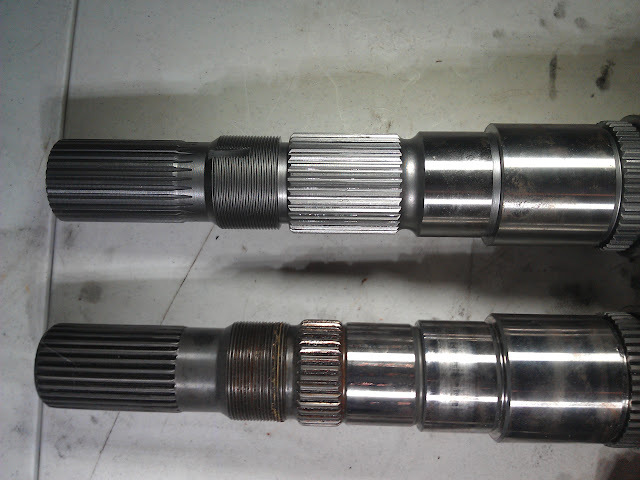 Here's the stock shaft compared to a new fully splined shaft. Unfortunately the new shaft I chose has a slip fit for the gear and is loose, as a result it will also experience similar wear as the previous shaft, but there probably won't be a failure related to the gear walking off the shaft. 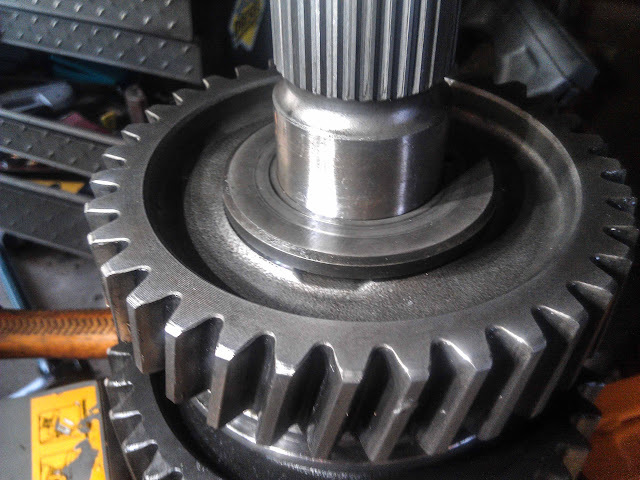 I chose to use the current fifth gear on the new shaft because it showed no signs of wear, the wear seen in the earlier photo was wear of the shaft. The reason for this is because New Venture at the time was one of the few manufactures who had their own in house vacuum carburizing furnace for their gears. Last edited by crazyrunner33; 01-08-2013 at 06:32 PM. On Cummins forum instead of working or doing homework. Awesome job!!! I'm bookmarking this for if/when I need to do the same on mine! 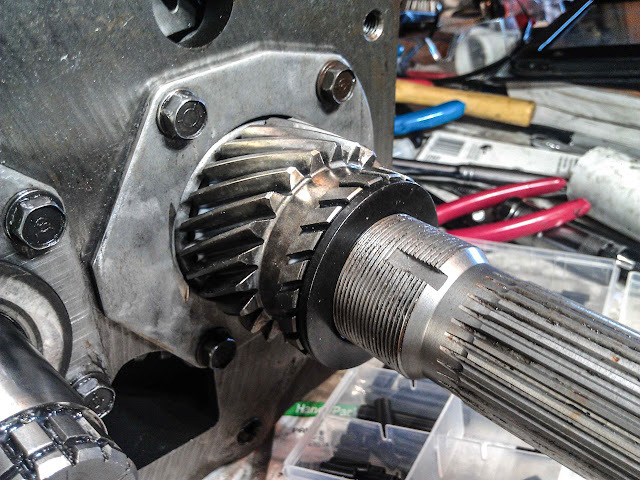 Just an update for people with an NV4500 from a 2wd GM. Drrth has sent a little information about some pictures to help remove the extension housing. I am working on an nv4500 from a C2500 with the GM 6.5TD. The external housing slides off about an inch after removing the 10mm star bolts, but will not come off completely until the 38mm/1.5" nut at the end is removed -- took lots of force to get this off. Glad I removed it before prying until something else broke. Pictures for the thread if you want to include them. Thanks again for the info. 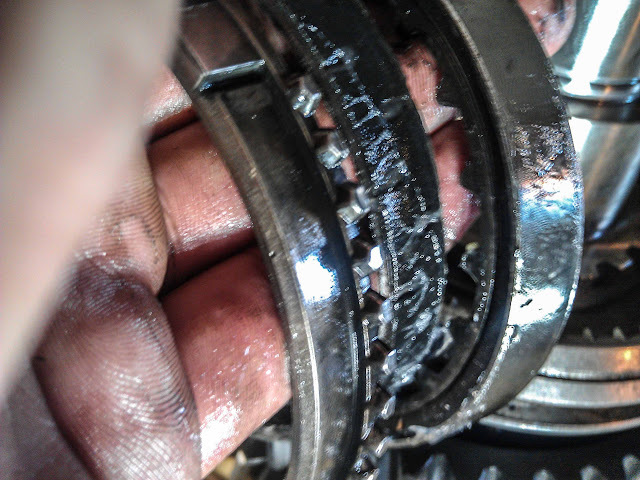 -There is a splined speedometer ring above 5th gear (rather than a nut or aftermarket fix) like with the Dodge version. It is not splined or threaded and was incredibly stubborn to remove on mine. 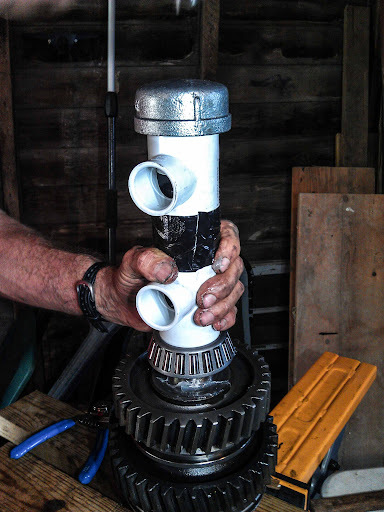 You will want to use a large bearing separator and a press to pull it. 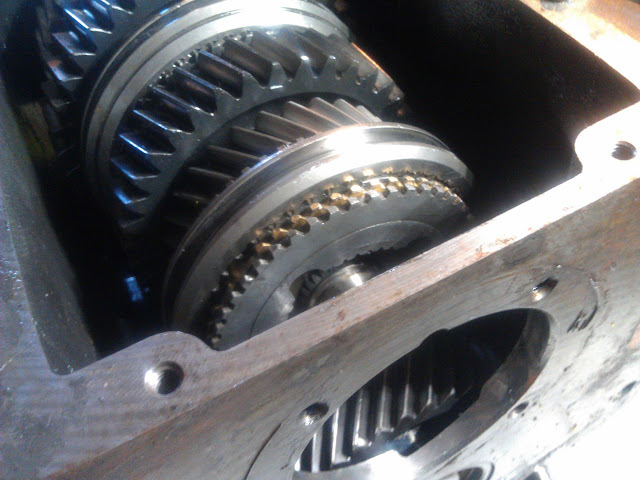 -The front mainshaft bearing likes to come apart during installation into the housing. Be careful about putting any pressure on it so that you don't have to fish 19 rollers off the floor. 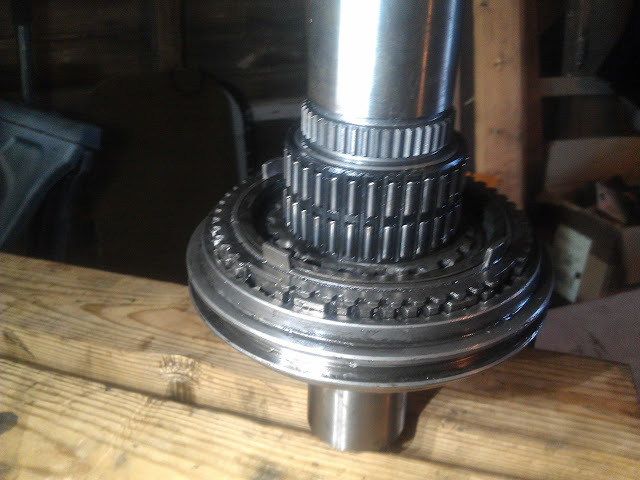 -The mainshaft can be really difficult to remove with the front bearing still on the shaft. you may need to use a crowbar to turn and position the edge of the countershaft so that you can slide it out. 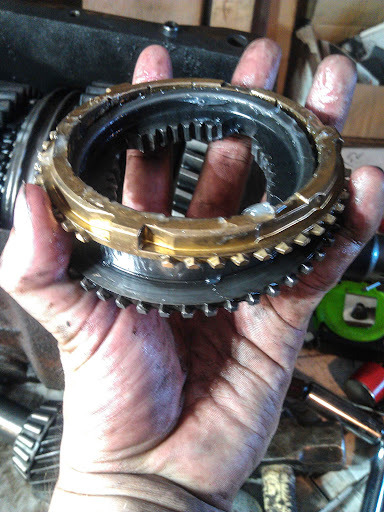 -My transmission did not contain a reverse synchro assembly. Not sure if this is something left out by a lazy rebuilder in the past, or if this version just doesn't use one. Last edited by crazyrunner33; 03-10-2013 at 11:27 AM.